It’s been a busy few months since our new puppy arrived, it feels a bit like we have been chasing our tail (excuse the pun) and haven’t really had time to blog. As he is settling down we find ourselves with a bit more time on our hands to get back into the swing of things. One of the advantages of having a puppy is a great excuse to get out and about to explore the local area, it has been fun discovering about our new town and the surrounding areas. It has now been a year since we moved to Whitchurch and we really do love it out here. It is a great little town with a good sense of community and it really feels like a place on the up. We have been meeting new people and making new friends (having a cute little puppy certainly helps). One of the things we like about our little town is the number of societies that make it a vibrant community. There are some well established ones, such as the Whitchurch History Society and some that have just been reestablished like Whitchurch Folk Club. Last year Whitchurch History Society held an event at the parish hall. They had laid out all their records and old photos of the town for residents to have a look through. We had a great look at the many photos/booklets etc that had been collected over the years. We also hit gold with a number of photos of our street. 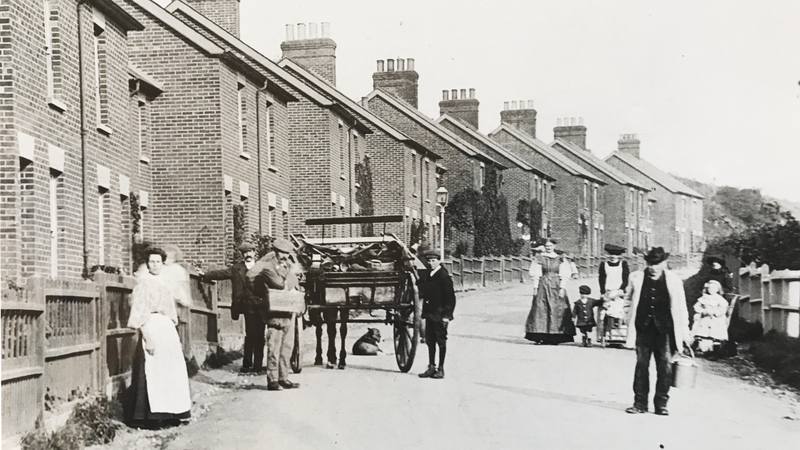 It is amazing to see that there has not been much change to the row of houses we live in since they were built in the 1890s. We recently watched the BBC programme A House Through Time, a great documentary looking back at the history of one house in Liverpool. Although our house is not quite so grand as the one on the programme we were interested nevertheless. We started looking up records but struggled to find anything about it before the 1960s. 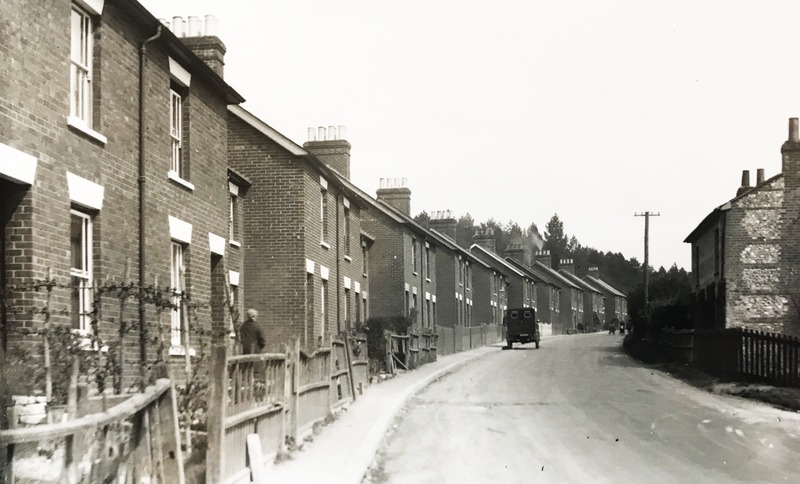 After some more research we found out that the street has been renumbered twice since out house was built. Armed with our alternative house numbers we started researching again, this time with a bit more success. The original owner of the house was a Mrs Lloyd, it seems she lived in the house for it’s first 26 years. We are slowly making our mark on the house and hope we can help preserve it for many future years during our tenure here. A happy home makes for many great memories and we can only hope we help support this at home. On Saturday we held a Friendsgiving dinner with a group of our close friends. 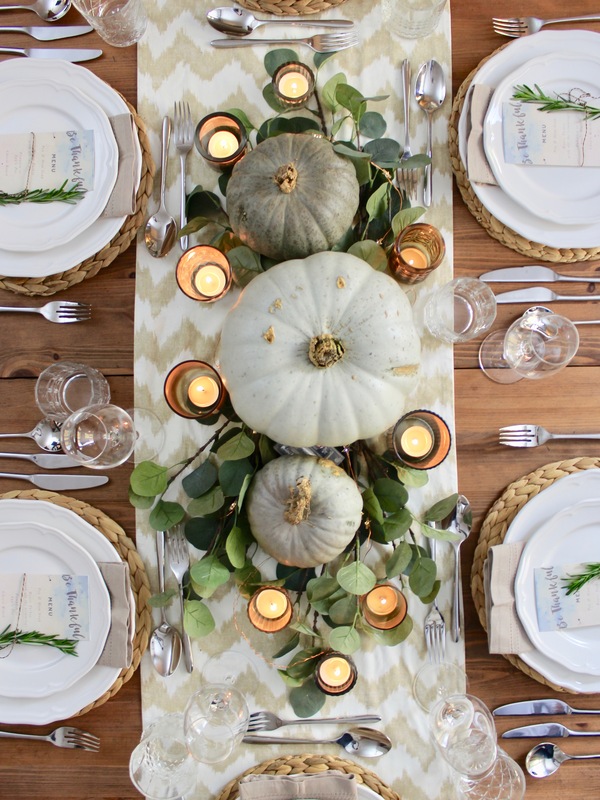 We have previously blogged about out love of Thanksgiving. Friendsgiving is basically just Thanksgiving but with your friends rather family! In America it is usually the weekend before Thanksgiving where you gather with your friends and enjoy good company, good drink and good food. We were in America for Thanksgiving a few years ago and enjoyed the gathering of family and friends and wanted to get in on the act. Its a great way to spend time with the people in your life that are important to you. 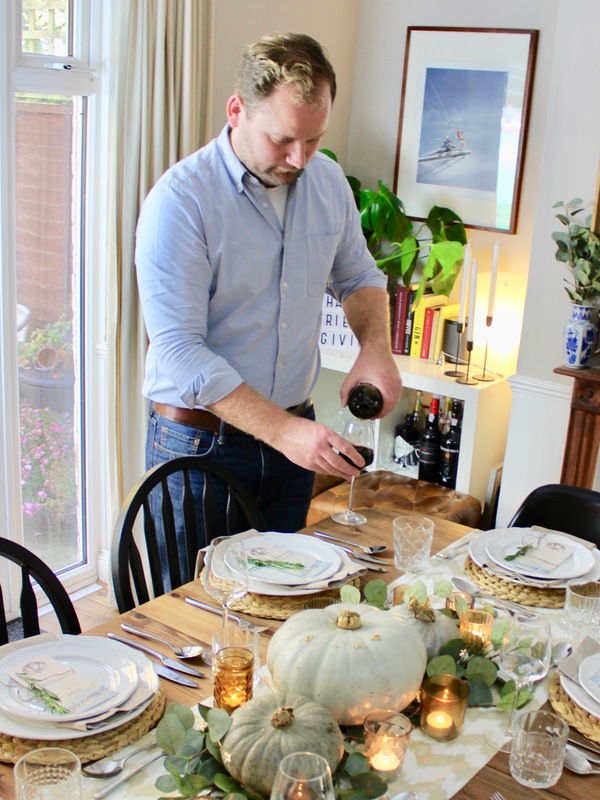 We enjoy lots of parties, outings, pub trips and days trips with our friends, but there is nothing better than joining each other for an evening of food, drink and company. It has been 10 months since we moved into our new house and are starting to pull together our style. 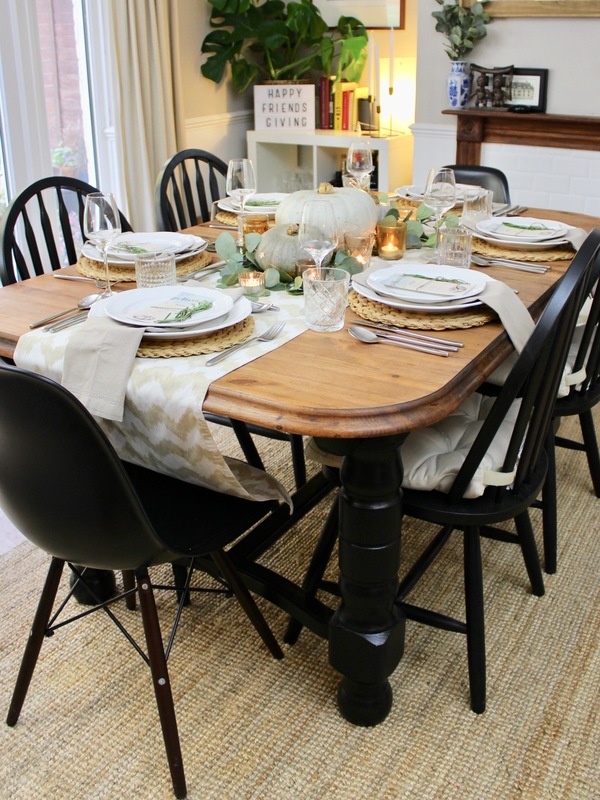 We have recently upcycled our dining room table, painting the legs and sanding back and rewaxing the tabletop. 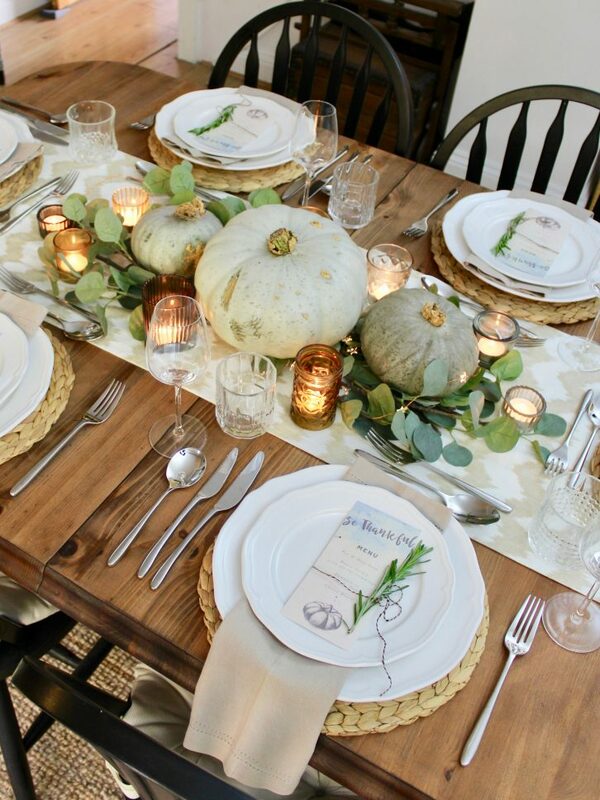 The refreshed table made for a good rustic theme to our setting. 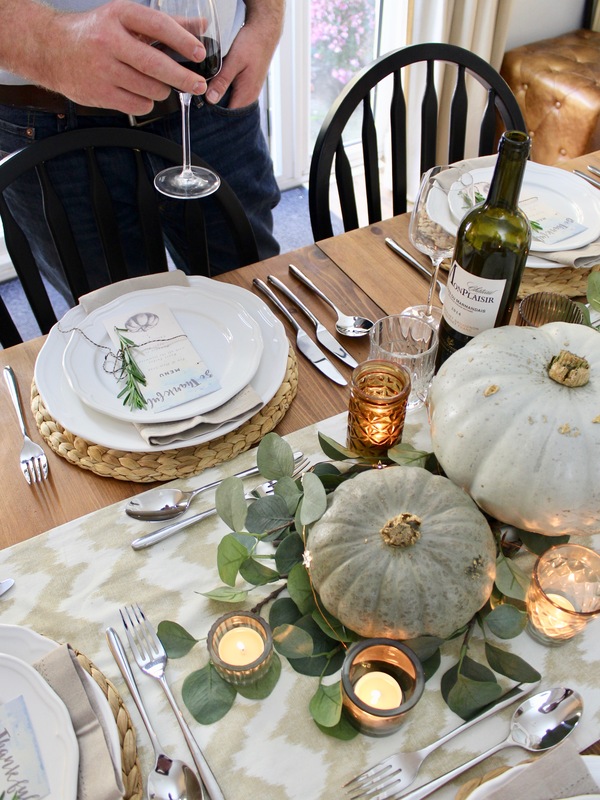 To decorate the table we wanted a different feel from the Harvest Dinner we hosted last year so this time we opted for a pale blue and amber colour scheme. 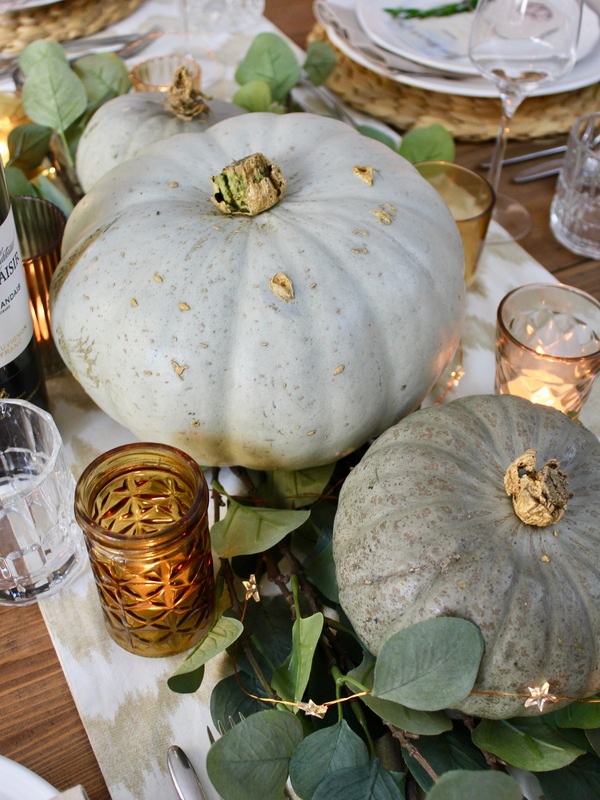 We used some blue squashes ‘Crown Prince’ as a centrepiece and a selection of amber toned voltives and some copper wired lights. 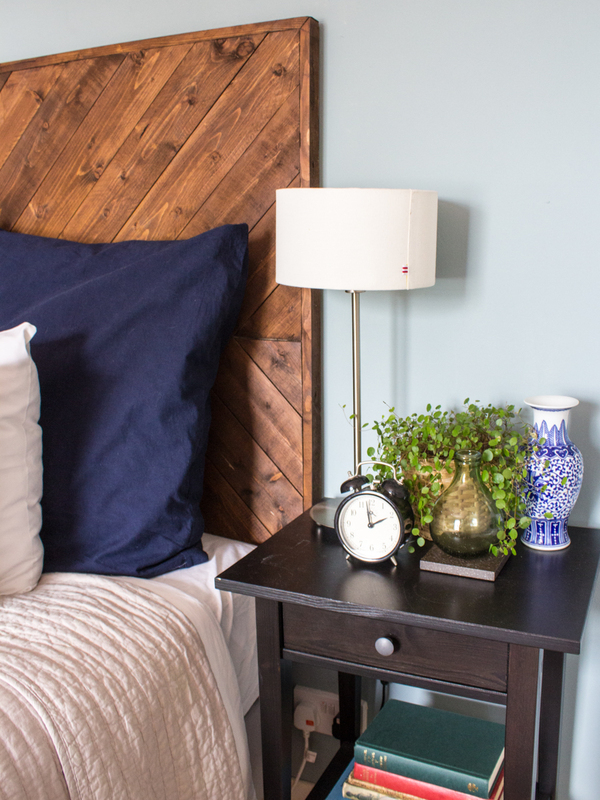 We placed this on the bed of eucalyptus to continue the pale blue theme. This year we used some faux eucalyptus we had as finding some fresh seeded branches was proving a bit tricky. Traditional Thanksgiving is always a roast turkey. It is essentially the same as Christmas dinner for the Brits. Calum does all the cooking whistle Rich make sure everyone has a glass of beer or wine! To start we had pea and ham soup followed but roast turkey with all the trimmings. To finished off with a traditional pumpkin pie for dessert. We had a wonderful evening, eat far too much and drank plenty!! 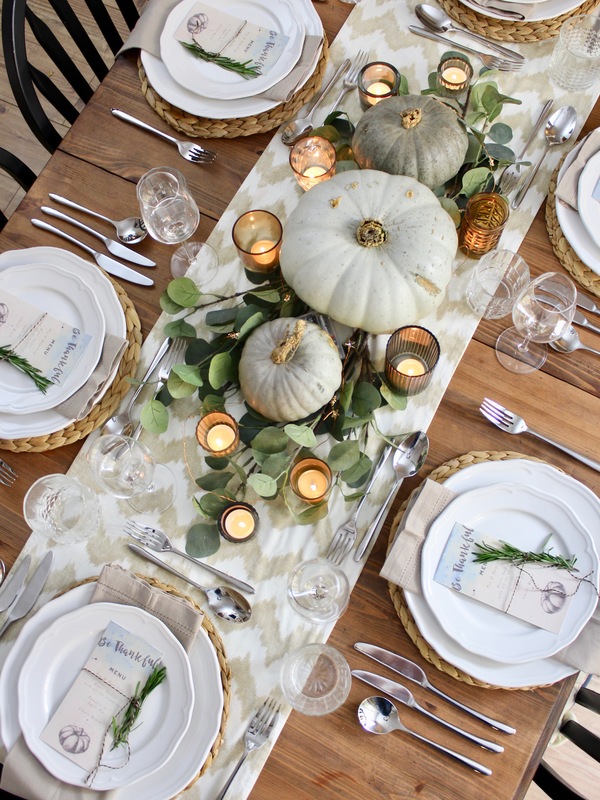 We loved hosting our friends and we will no doubt host another friendsgiving in years to come. Since we have lived together, Rich has been keen to get a headboard for our bed. 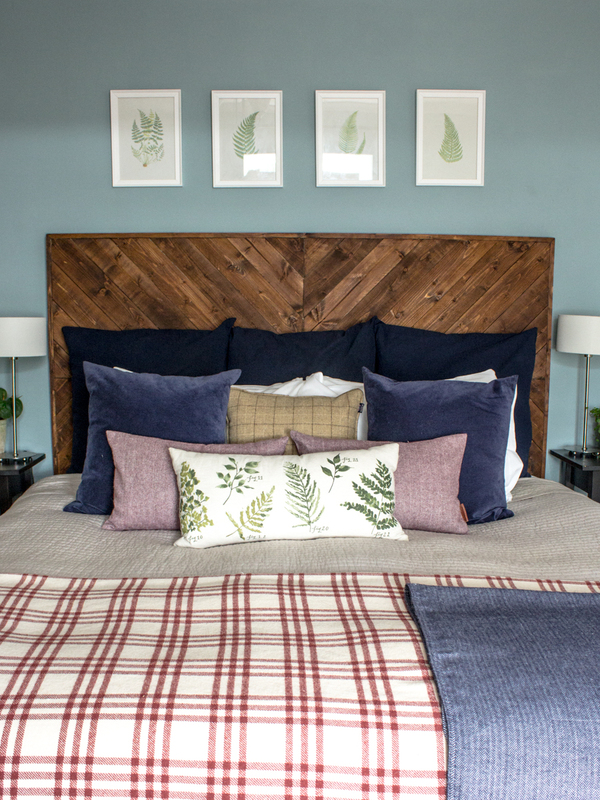 Inspiration for this came from a trip to the USA and a visit to a West Elm store. Whilst wondering around the store, Rich came across a headboard that he liked. Unfortunately, it was too big to try and get back to the UK. 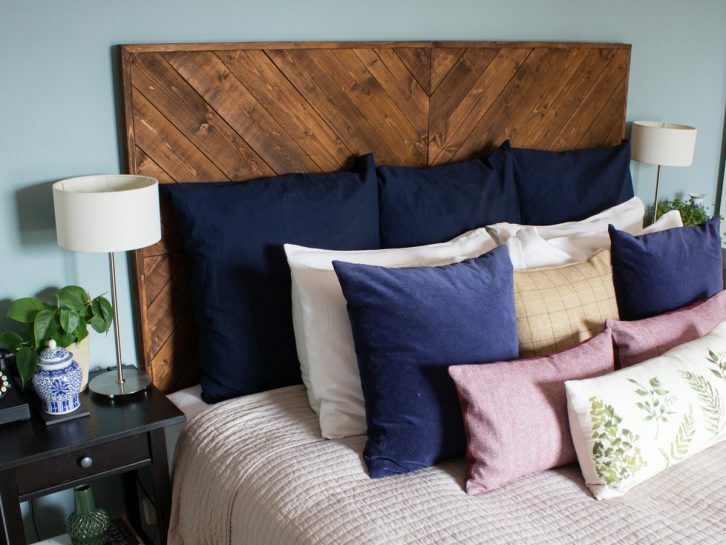 Many searches for a similar headboards in the uk came up with nothing. After we painted our bedroom, we agreed that we needed to do something about this and build our own headboard. Right, we can do that! One of the benefits of space in the garden is being able to do a few large scale projects. This is the first of many projects that we want to complete and help make our house a home. Armed with a few tools, some wood and wood glue, what could go wrong! We decided that we needed a base board to help support the head board and had this cut to size at B&Q. Unfortunately we were unable to find the wood at the thickness we wanted, so settled for planks at 19mm. We had originally wanted to use pallets but don’t yet have a planer to strip the wood down. 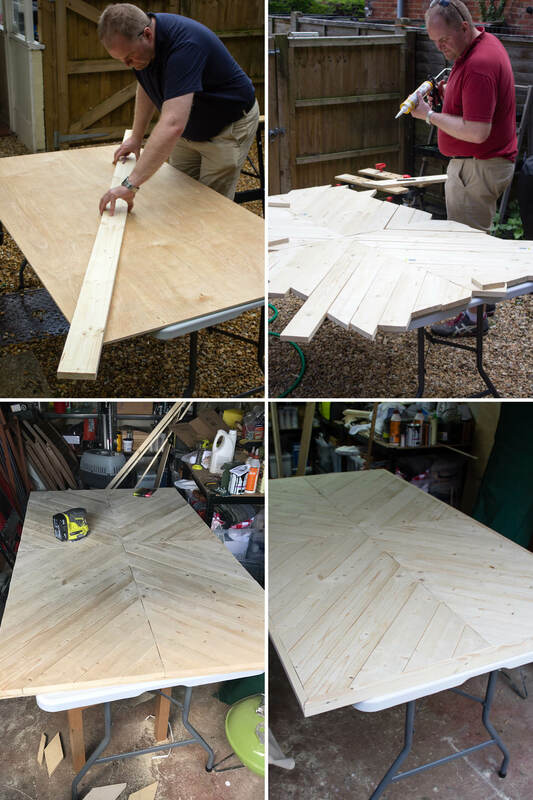 With the planks, some careful measuring, and a few trial cuts, we were able to get the pieces cut at roughly the right angle using the circular saw. It would have been easier with a mitre, but will need to save up to get one of those! Starting with the middle join of four planks, we worked our way out to the edges making sure that every piece fitted snuggly with the next. Once all the pieces were cut, we glued them down with a little space between each plank as we could manage. Once dry, we flipped the board over and screwed each plank in through the base board to make it more secure and saw off the over hanging ends of each plank. Flipping it back, we then started sanding down the surface of the planks to make them as smooth as possible and attached the trim. After a few days of sanding, we applied a stain on the wood to give it a warmer colour. 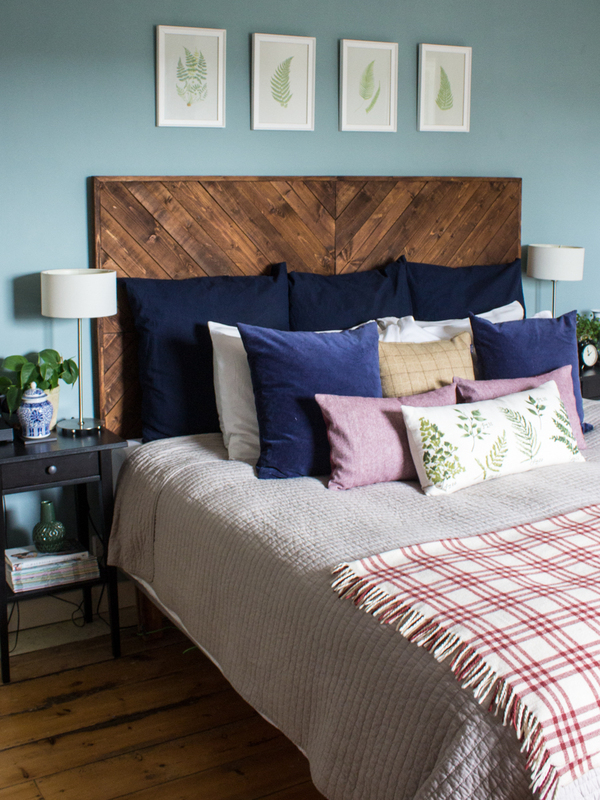 We decided that the wood colour Medium Georgian Oak was best for the headboard and compliment the room well. We gave it three coats, a couple of teak oil coats to seal the wood and spent the next few days buffing! 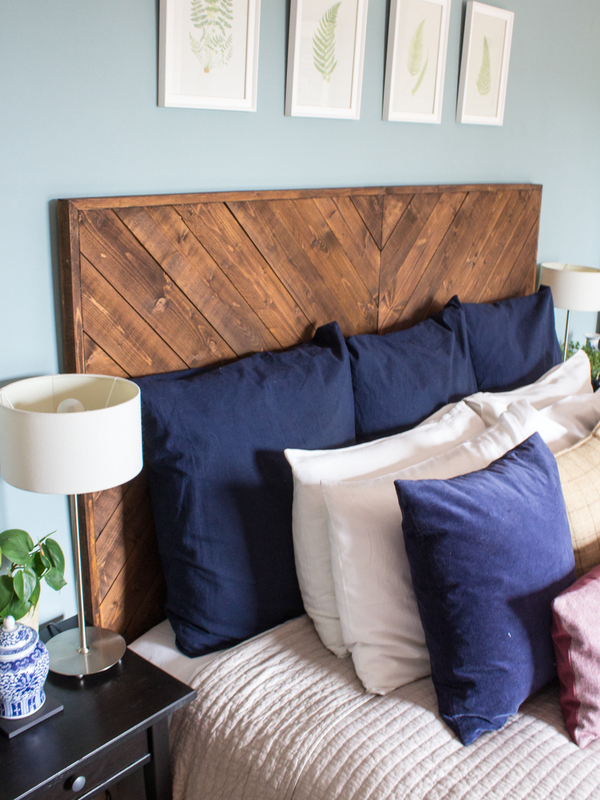 To hang the head board, we found a three piece headboard hanging kit on eBay. Given that the board is fairly heavy, we felt more comfortable with three securing points rather than two. A fair amount of measuring and the spirit level meant that we were able to attached the headboard with ease just below the mattress line. We are happy with how it turned out, if we ever make another one, we will need a mitre and a planer. What do you think? Does it help improve the look of the room? When we moved into our house in January, a ‘selling’ point is the proximity to the Bombay Sapphire gin distillery. 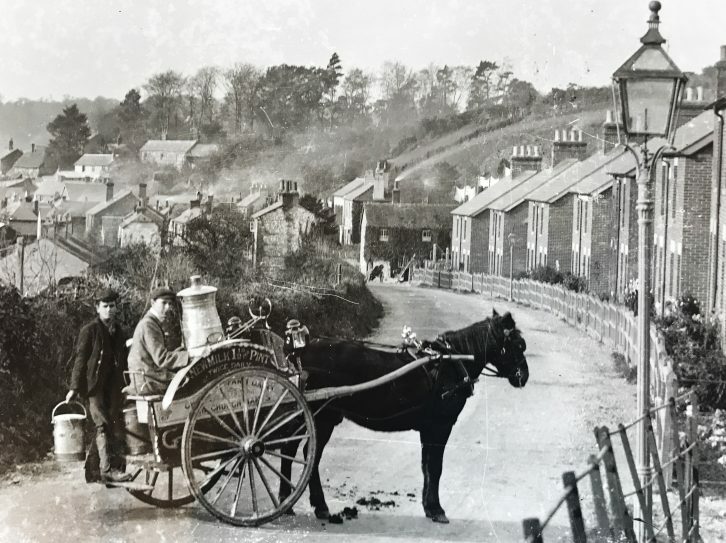 This is something we learnt after we bought the house, and at a mile and a half down the road, it is great to be able to send people off to sample the local gin. For some of our friends, we are not sure if they were coming to see the house or to get a sneaky trip in to the distillery! A few weeks back we had a group of friends come and visit. This group fit into the ‘nice house, where’s the gin?’ category and came to visit the distillery (as well as us!). 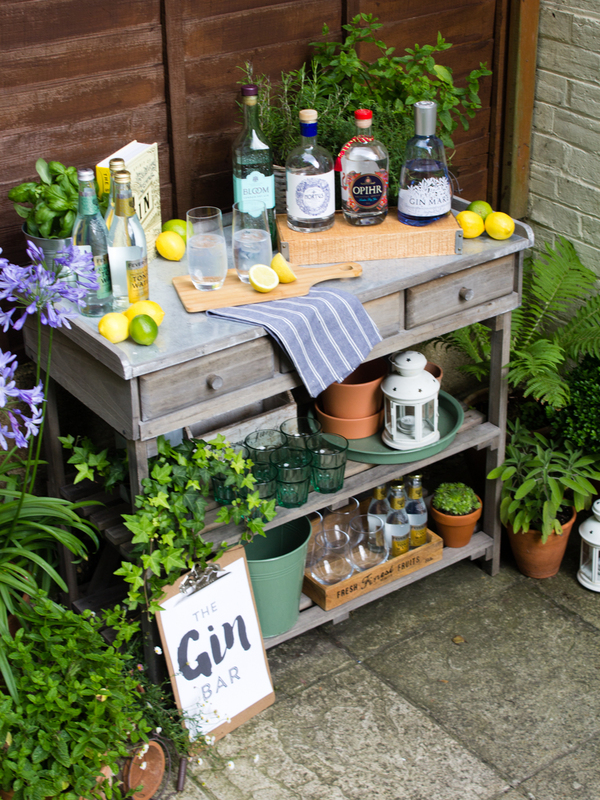 We thought it would be a good idea to carry on the gin when they returned and decided our garden also needed it’s own gin tasting bar, so we started getting creative. 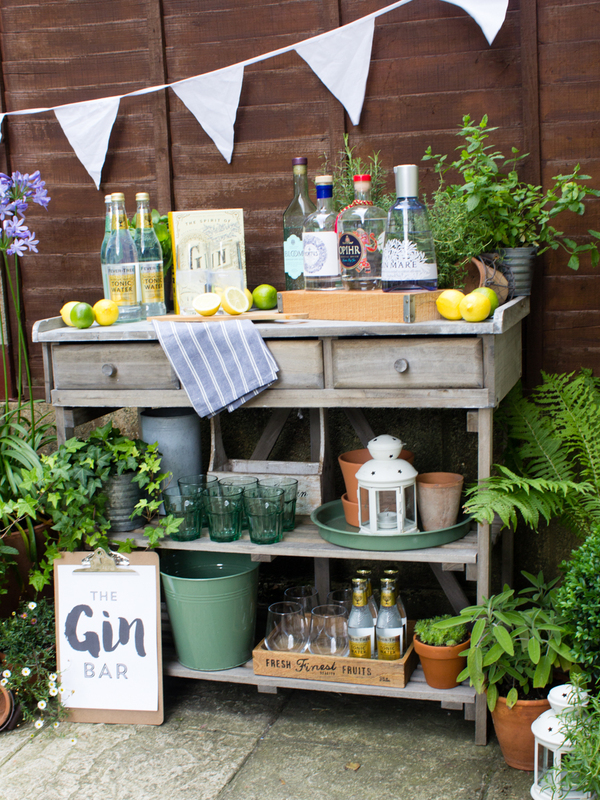 Who doesn’t want a gin tasting bar in the garden? We recently bought a potting table from Clas Olsen that makes for a great decorative counter and a good start for a bar, along with its practical purpose of a potting table. 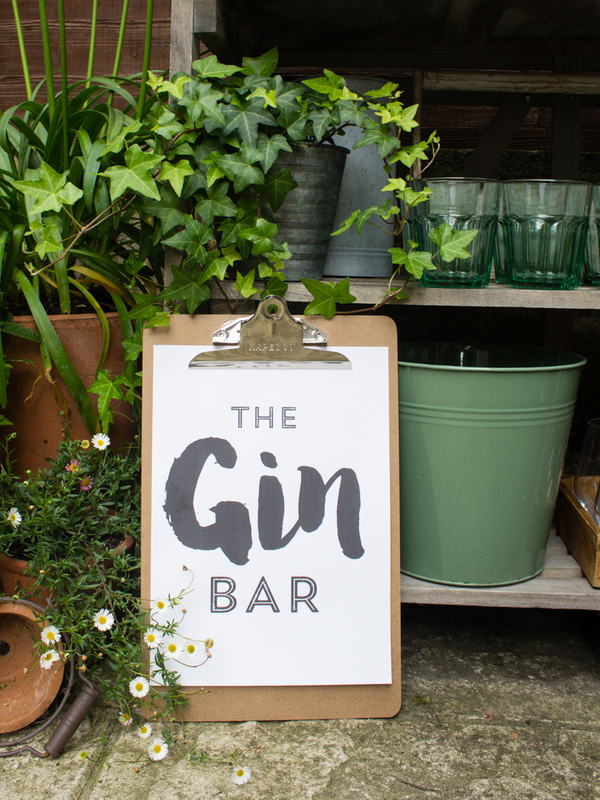 A few herbs, plenty of glasses and clear signage gave us the start of the bar. For bar supplies try Ikea, H&M Home or TK Maxx. To make the perfect gin, you do need a good tonic. 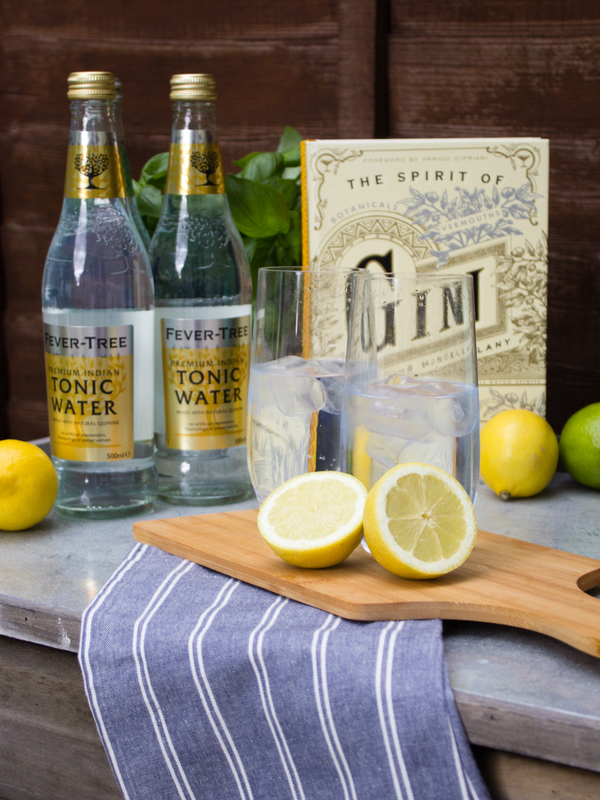 We tend to like the FeverTree tonic over the others as it has a more subtle flavour. Plus it comes in glass bottles that look good and are easier to recycle. We learnt about garnish for cocktails at the London Gin Club. 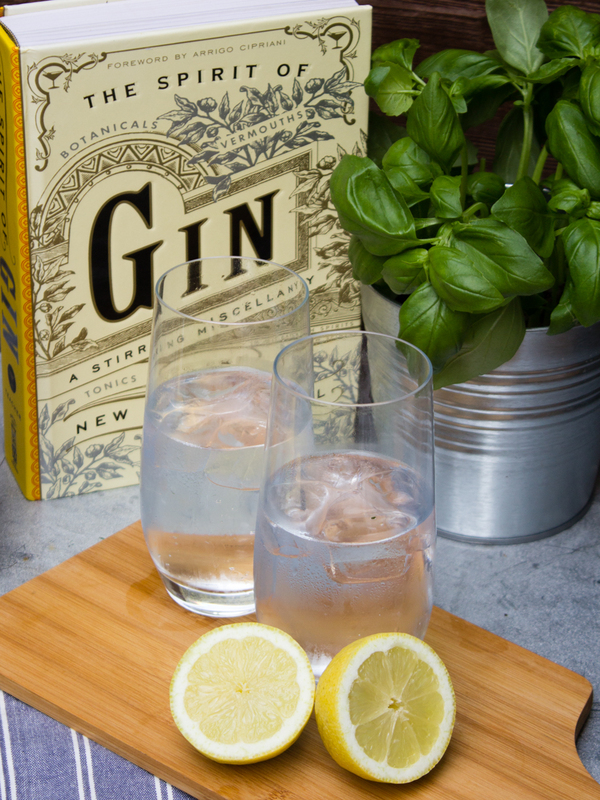 Garnished definitely help make a good G&T, bringing out the flavours in the gin. For the gins we selected, we had a range of garnishes from ginger and thyme to strawberry and lime. The herbs weren’t there just for decoration! 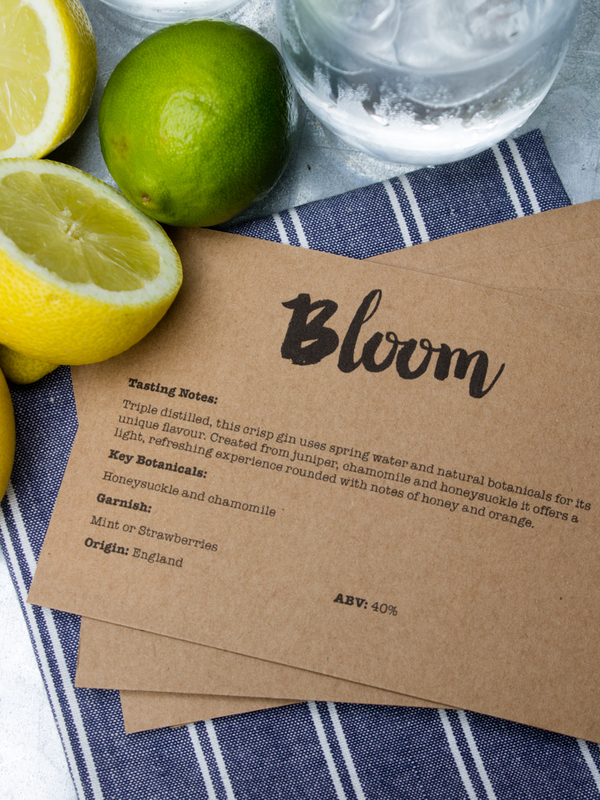 Each gin has its own history, botanicals and distillery method. One of the great parts about tasting notes is learning the history. The best part is tasting the gin and knowing what to look out for when you taste the gin are given to you in the notes. It is important to taste the gin at its absolute best, the tasting notes give you the hints to ensure that! As Bombay Sapphire had already been sampled that day, we decided to go for a few other gins. 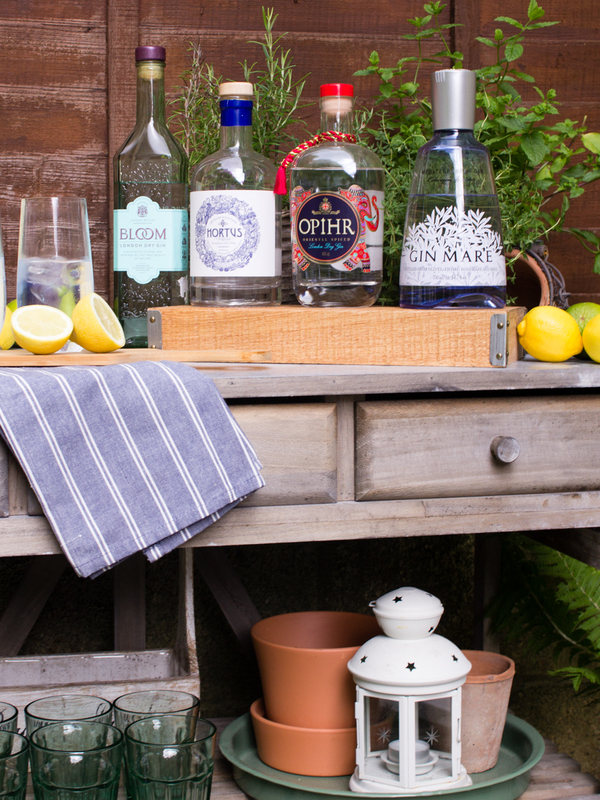 Some choices were made and we found – okay we raided our bar – a bottle of Ophir, Gin Mare and Bloom. 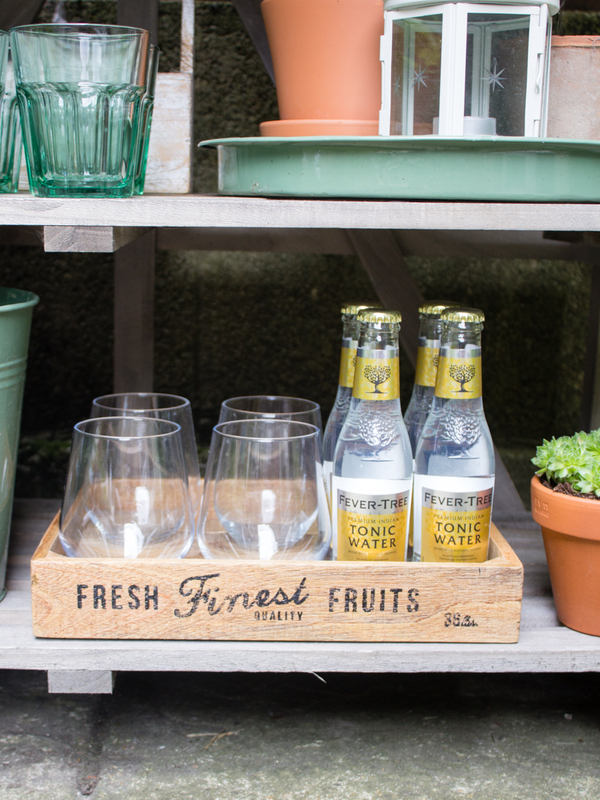 On a trip to Lidl we found their own gin – Hortus. All great gins and a great selection of gin that is currently available. 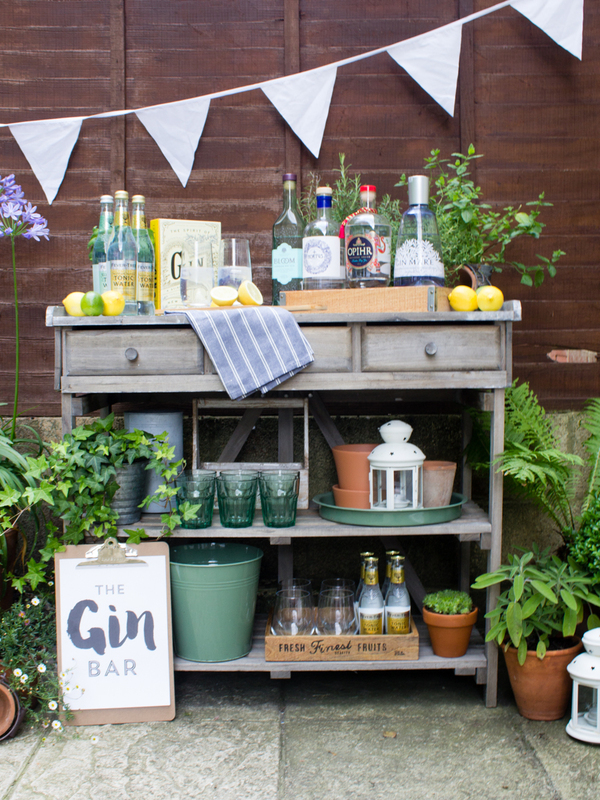 We can say, with certainty, that every house should have a garden gin tasting bar. We have had a number of bars in the past and they make for a great focal point. What do you think? 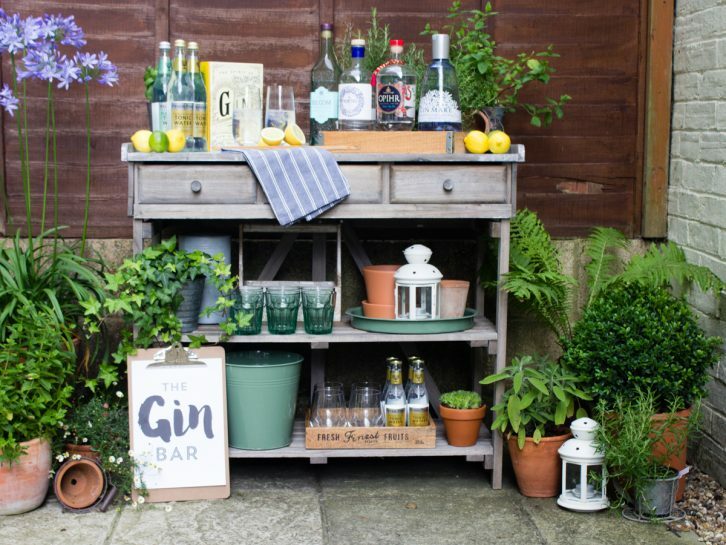 What else would you add to the gin bar? If you follow Rich’s Instagram you have probably realised his love of gardening. For the first time in many years we have a garden to potter about in so we are going to start doing a few gardening updates on the blog to share our successes and failures. To start off lets have a look at the Roses we have planted in our new garden. 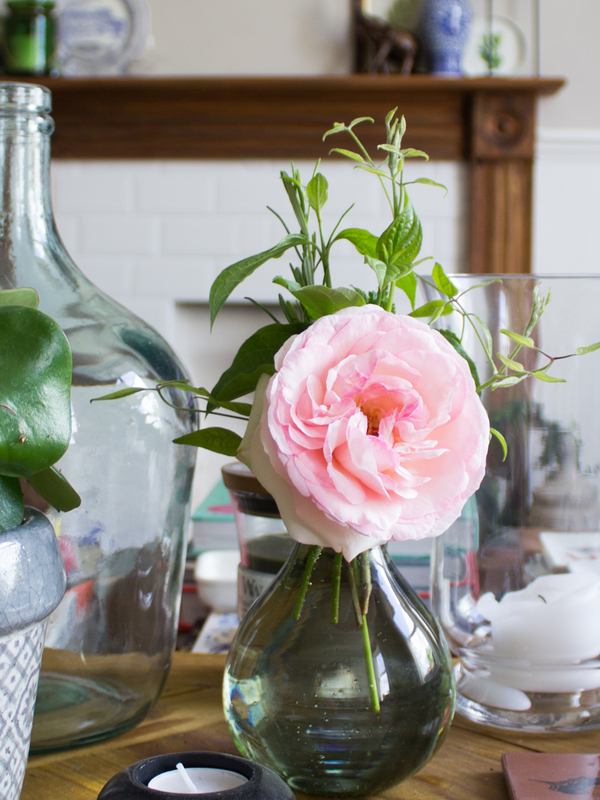 We love roses, especially old fashioned and vintage style roses. Four out of the five roses we have chosen are English Roses from David Austin Roses. David Austin is the breeder most often associated with this style of rose. He has bred hundreds of varieties dating all the way back to the introduction of ‘Constance Spry’ in 1961. As we have a relatively small garden we have opted for repeat flowering varieties to get the most from our plants and in general we like our roses to have strong scents. We fell in love this rose when we went to the Loire Valley last summer, when we were thinking about roses for our garden we knew this was a must. Developed by the French breeders Meilland International, we found it everywhere in France but a bit trickier to find in the UK where it is sometimes sold as Eden ’88. It is a modern climbing rose with big old fashioned flowers. The buds are cream on the outside and pink on the inside, as the flowers open the pink gently fades to a very pale pink.. They are big flowers that sometimes droop under their own weight. It needs a hot and sunny position to get the most of this rose. We are growing this rose in a container with a support against a south facing wall, so far it is going very well but the flowers got a bit bruised by the recent rains. The only downside of this variety is it has almost no fragrance but the gorgeous flowers really make up for that. 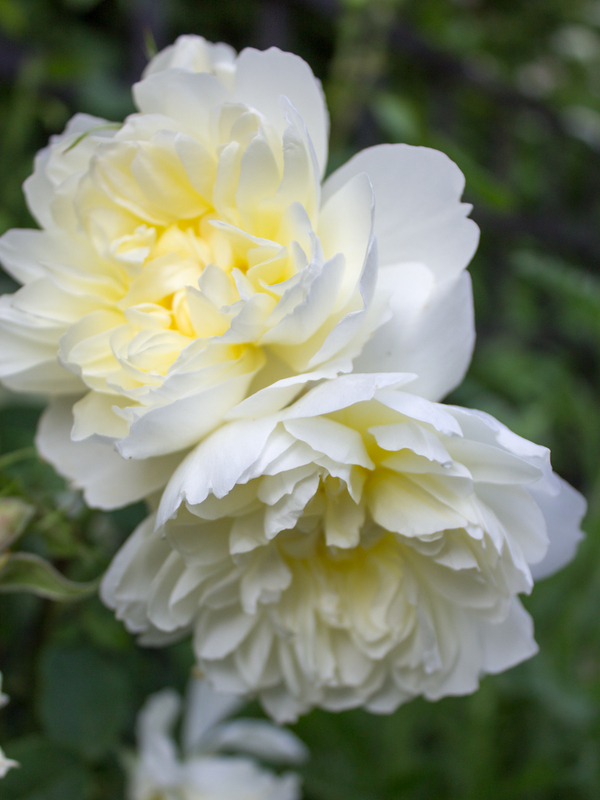 Our garden’s colour theme is mostly soft blues, purples and pinks but as a counterpoint we are using pale yellow flowers, we therefore wanted a pale yellow rose to continue this theme. 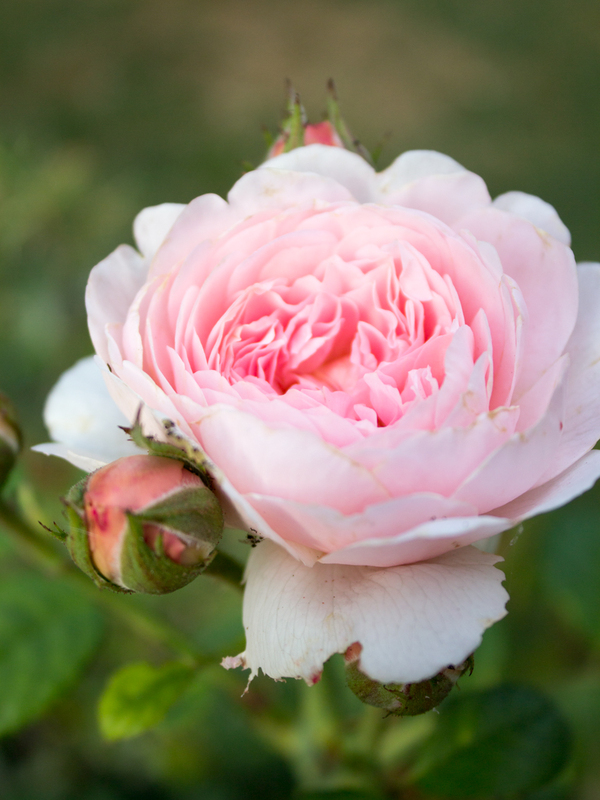 We chose David Austin’s 2016 introduction ‘Imogen’ to do this job. We are prone to buying roses because we like their name, which at guess is why they are named so! Our love of Scandinavia has behind this buying choice. David Austin’s Queen of Sweden was named in honour of the 350th anniversary of a treaty of friendship between Great Britain and Sweden. Queen of Sweden has lovely cupped flowers in an apricot pink colour that fade to soft dusty pink. It has an upright growing habitat which makes it an excellent rose for cutting for arrangements in the house. It has a very light myrrh scent. 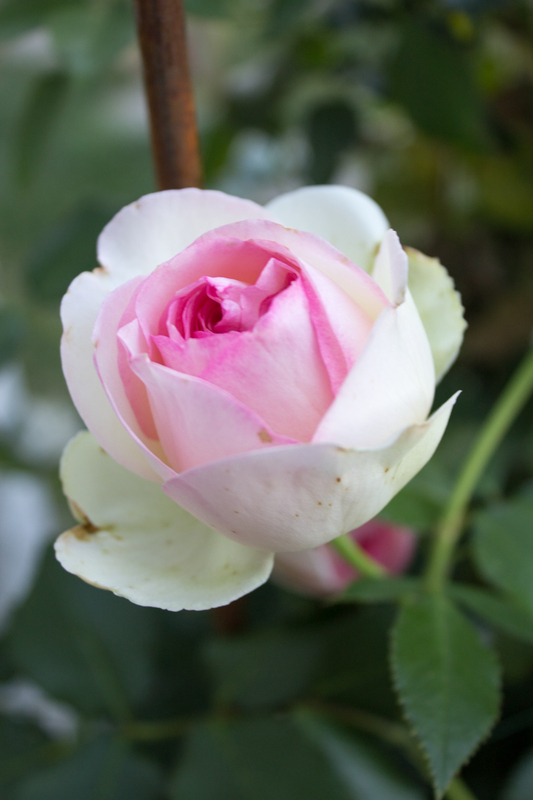 Queen of Sweden is definitely the most romantic rose in our collection. 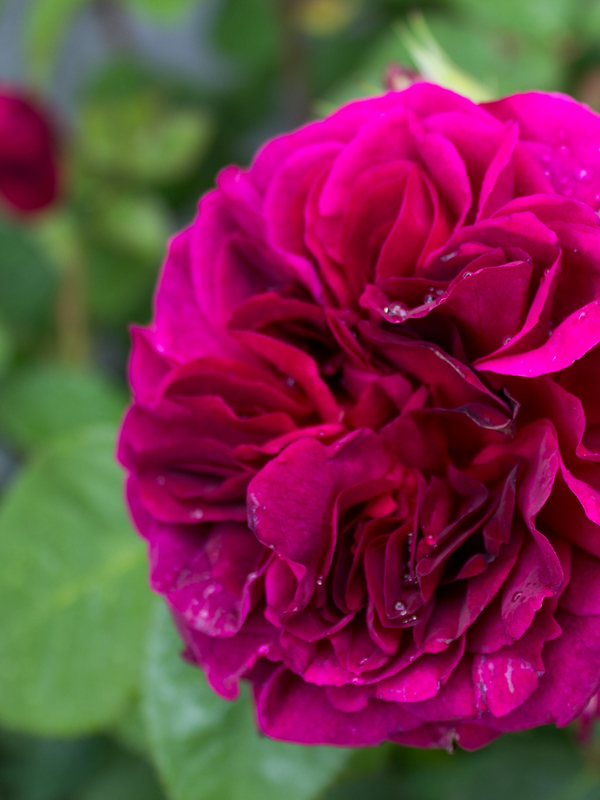 We wanted a darker rose to add to our collection and a bit of research led us to choosing ‘Munstead Wood’. Another of David Austin’s English old rose hybrids, this rose is named after Gertrude Jekyll’s Surrey home. This rose has been described as sultry and intense. It has burgundy red colour, halfway between red and purple. The flowers are large and cupped that become shallower over time. Out of all our roses this has the headiest scent, it really hits you when we are out in the garden first thing in there morning. The scent is describe as having notes of blackberry, blueberry and damson. 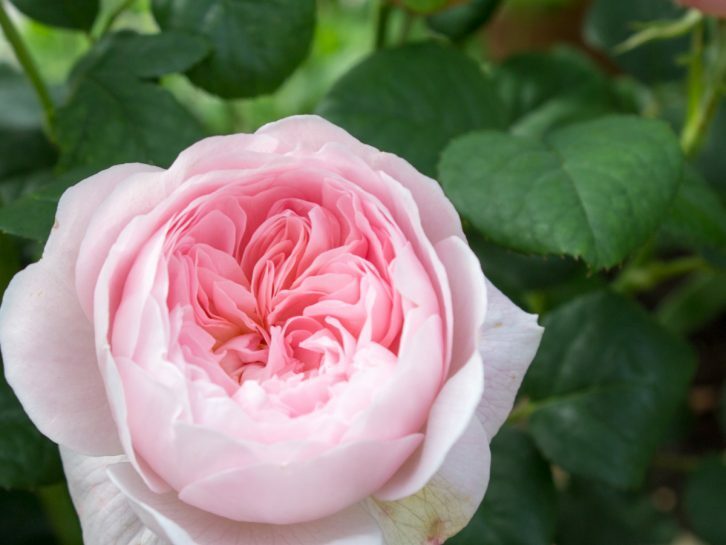 Scent is important to us when choosing roses which is why we settled on ‘Gertrude Jekyll’ one of David Austin’s best selling varieties. Names in honour of one of the most influential gardeners of the 20th century (and one of Rich’s gardening heroes!) 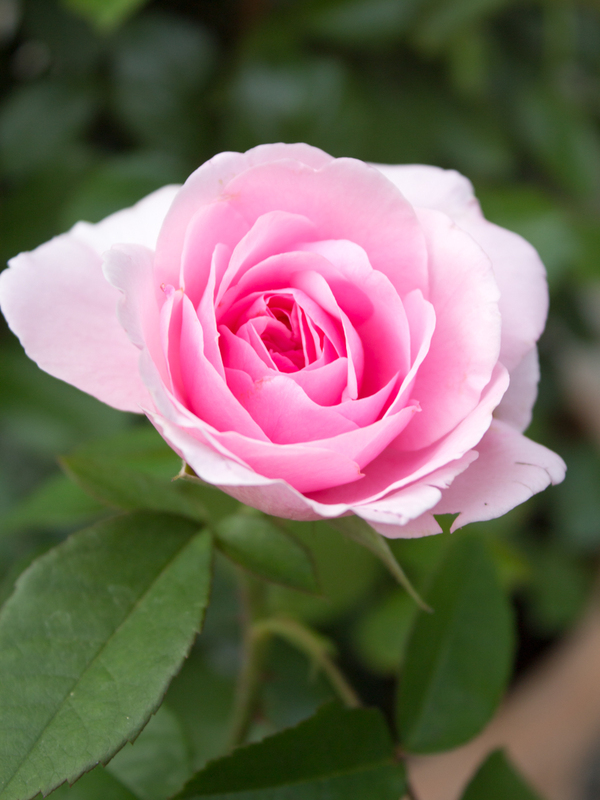 this is a great all round rose that can be grown as a shrub or as a short climber. Gertrude Jekyll has small dark pink buds that open into big mid pink rosettes with a very pretty spiral of petals. The scent is very strong and described as the quintessential rose perfume. To make the most of the fragrance we have planted this near to our back door. We have very quickly become ‘Roseaholics’ and we are sure to be adding to our collection as the garden develops. We have our eye on ‘Winchester Cathedral’ a honey and almond scented white rose, and ‘Surrey’ a ground cover rose with pink frilly flowers. We are also on the hunt for the perfect rambling rose, and there will no doubt be even more added to our collection! Do you have any recommendations please let us know in the comments. We have now been in out house for almost six months. We have settled into Whitchurch nicely and have started some projects around the house. This week we are going to give you a couple of little updates; the fireplace in the living room and the master bedroom. The first room we painted was our living room. The room was previously mint green below the chair rail and white above, not really to our taste. We decided to flip the colours to have the white below, we painted this in Crown’s Canvas White with a silk finish. 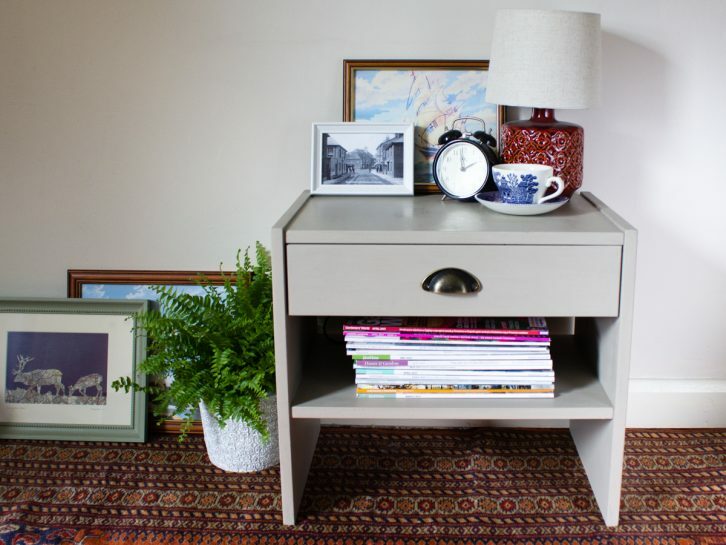 Above the chair rail we opted for Lopen Taupe from Hemsley Paint. 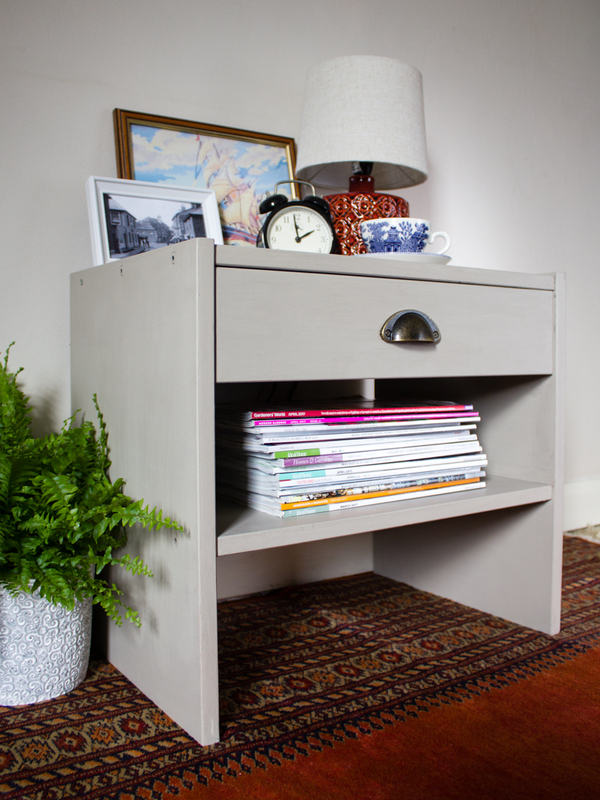 Hemsley paint is only available from Homebase, it is an ultra matt finish and makes a great and affordable Farrow and Ball alternative. We are planning on installing real fireplaces and exposing the brick. In the meantime we decided we needed a stopgap solution. 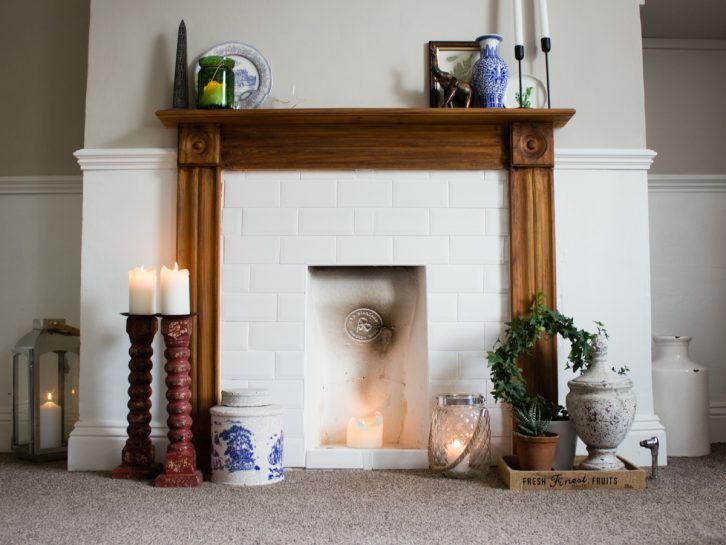 We look at the fireplace everyday and the dated green tile surround just had to go! We opted to replace the tile with a white mini metro tile. This was a value option that keeps the fireplace light and clean and give it a more modern feel. We also stained the pine mantle taking it from an orange colour to a darker shade so it doesn’t have such a 1990’s feel. If we are honest nothing beats the feel of a real fire in a house. It’s one of those things that makes a house a home. We are not going to get our fire this year so we are just going to have to improvise! 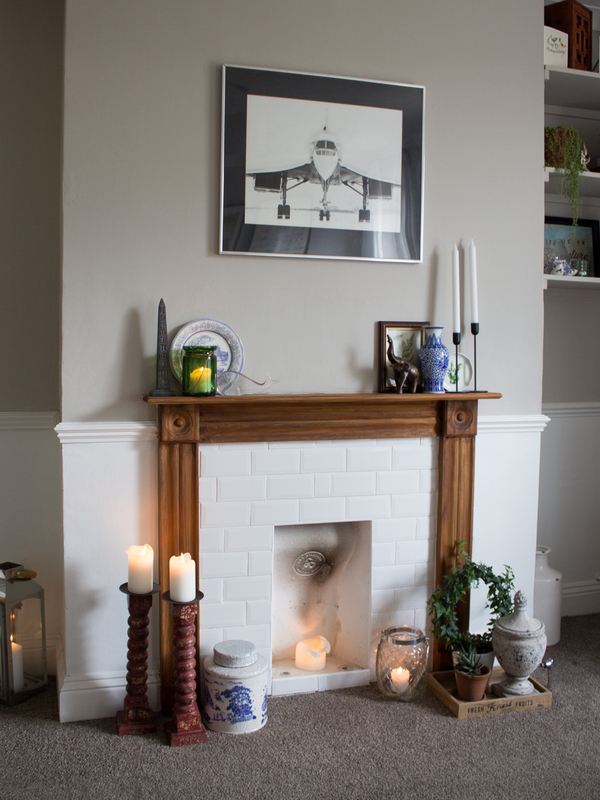 We might not have a fire but we can have candles… and lots of them (thank you Ikea). 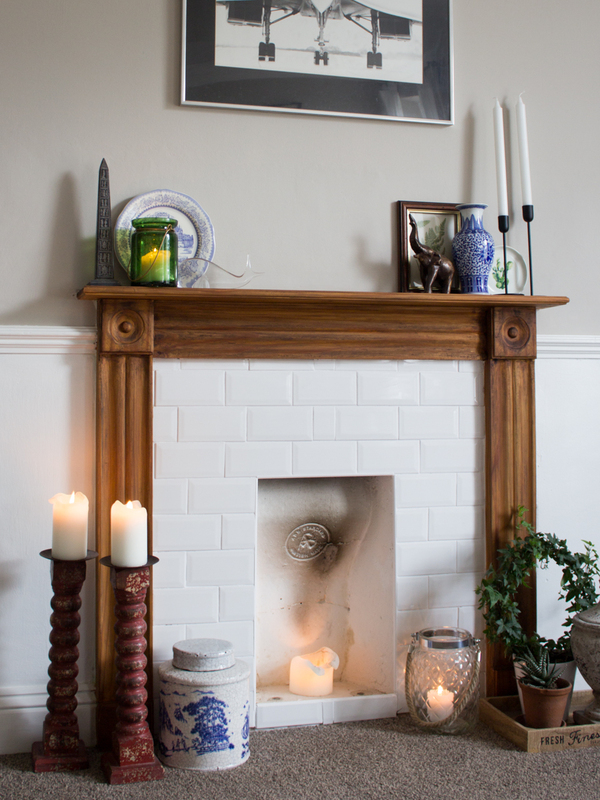 The candles give a lovely feel to the room, they also come in handy when we had a power cut a couple of weeks back! 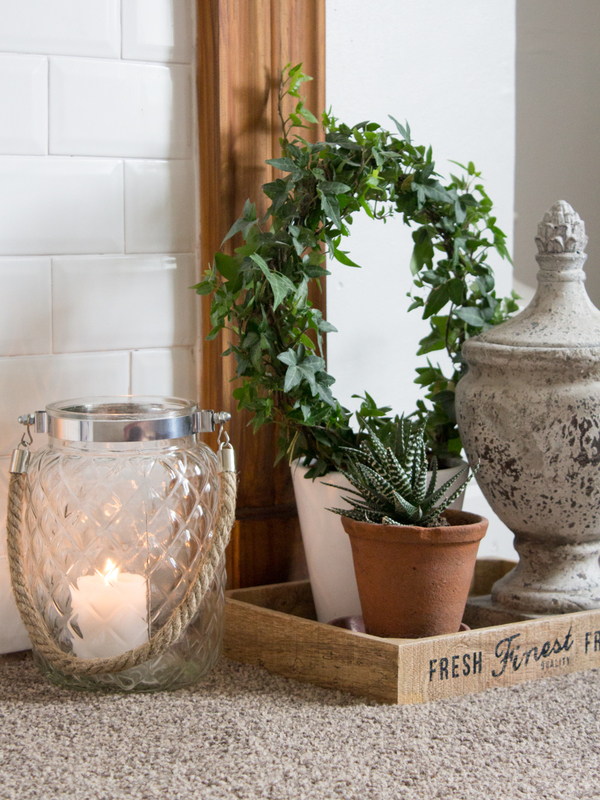 We know this isn’t our ideal fireplace but with a bit of styling it holding its own. 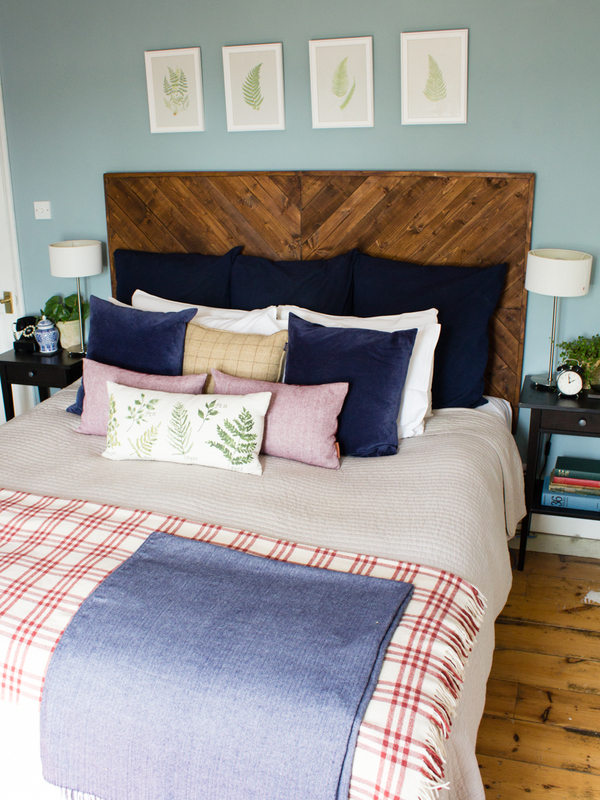 We have used a mix new purchases and old favourites to soften the look. As the living room is a very bright room we also have a couple of houseplants. One thing of interest is the the Concorde artwork – it is over 30 years old and was a retirement present to Rich’s grandfather who was a production manager on the original development of concorde in the 60’s and 70’s. 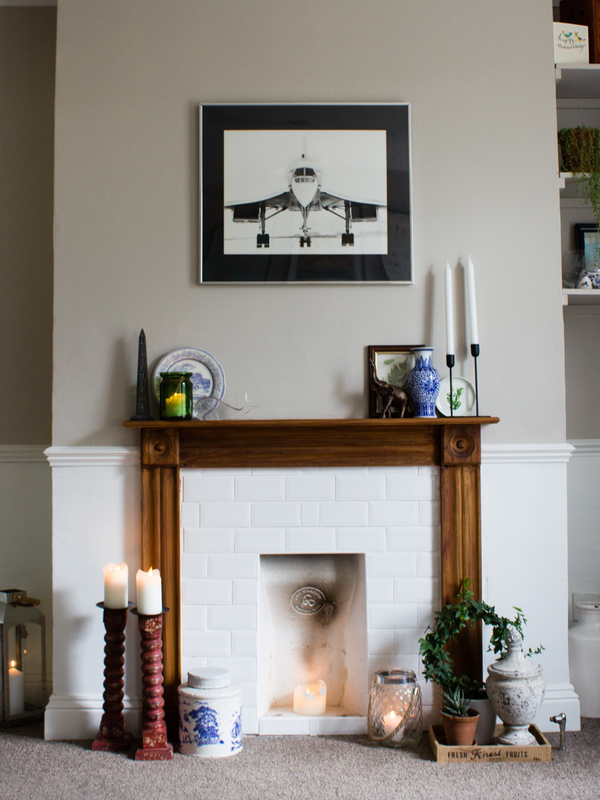 In total fire fireplace refresh probably cost us £30, not bad for a stopgap solution. What do you think, do you like or should we have just waited until we could install a full working fireplace? As spring made its appearance, we made the most of the outdoors and the Hampshire countryside. 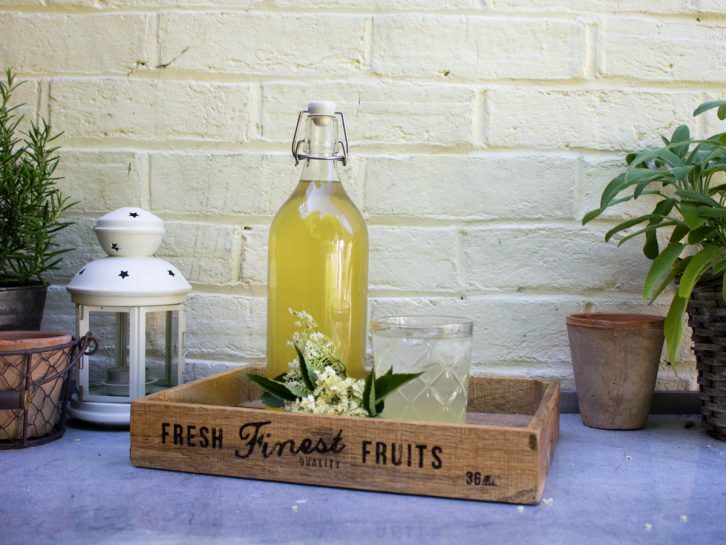 One thing we noticed on a recent walk was the number of Elderflower trees in the vicinity of the house and decided we would make our own cordial this year. 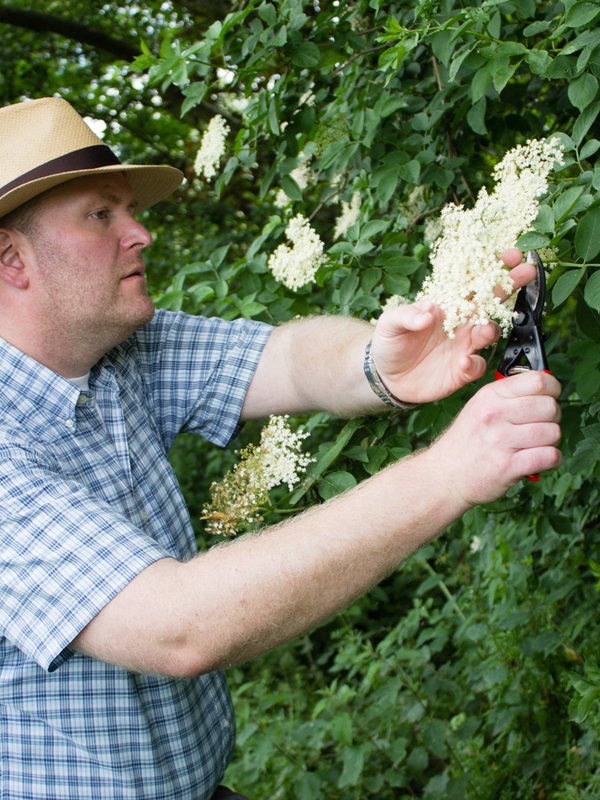 Armed with a scissors and a bag, we ventured out to gather a number of Elderflower heads. It seems that this is a popular activity in Hampshire as it looked like a few people got to the easier to reach branches before us. 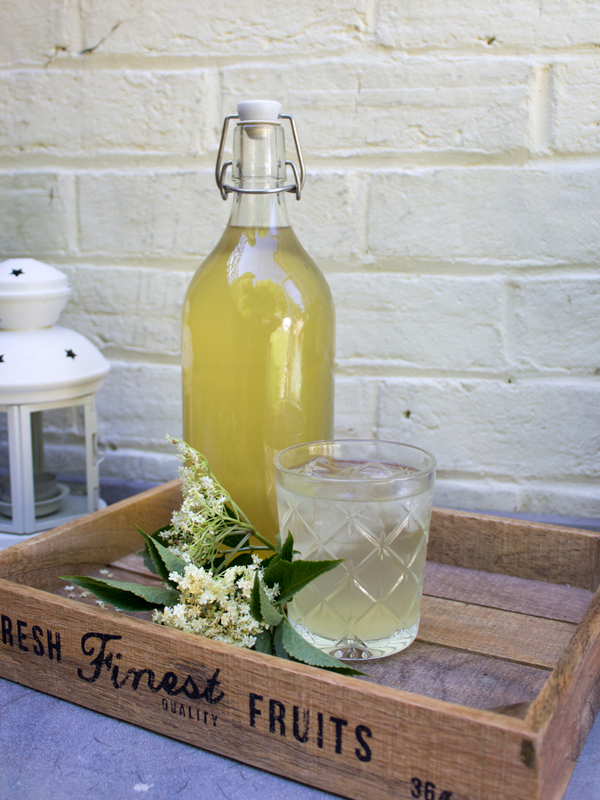 Elderflower cordial is a drink that can be tracked back to Roman times. This may explain why it is used through out Europe. 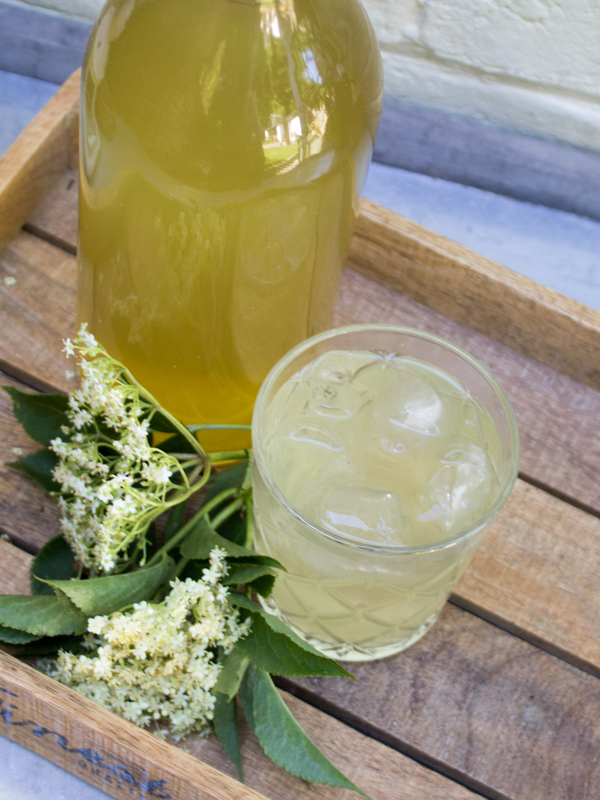 The cordial is made from the flowers of the Elderberry tree and can be used in many different drink combinations such as diluted with water, sparking water, champagne or many other suitable cocktails. Once home we looked up a few recipes and settled on the Jamie Oliver as it does not use as much refined sugar as the others we found. A quick rummage through the cupboards and we found what we needed and started following the instructions to make the cordial. It was easy to follow and great to know that it is an easy cordial to make. The hardest part was cleaning the flower heads and the number of insects we shook off was a little surprising. A note for next time that we should shake the flower heads out before harvesting! We left the mix over night to steep which meant that the kitchen smelt wonderfully of a sweet elderflower mix in the morning and we could not wait to enjoy the cordial! We bottle just over two litres of the cordial ready for use. The cordial is fantastic and doesn’t taste as sugary as others we have tried. It will make a great addition to our future parties and cocktails over the summer. Especially our Swedish Midsummer party in June. Moving into our house a few months ago, we have be trying to work out what we want to do with the rooms. Plans are hatched and then changed, and changed again! So many ideas, but we are narrowing them down! As we moved from a furnished flat into an empty house, we need lots of furniture. With our plans changing as the house develops, we didn’t want to buy big pieces only to find they don’t work. 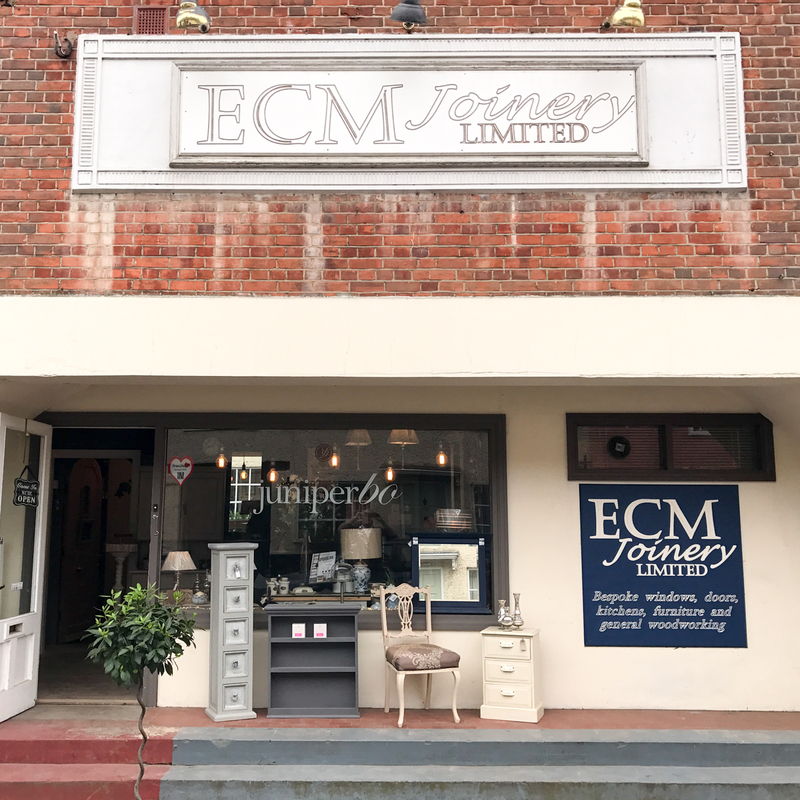 As furniture upcycling is something we have done before, we decided that it would be a good idea to do this again whilst until our plans were still changing. 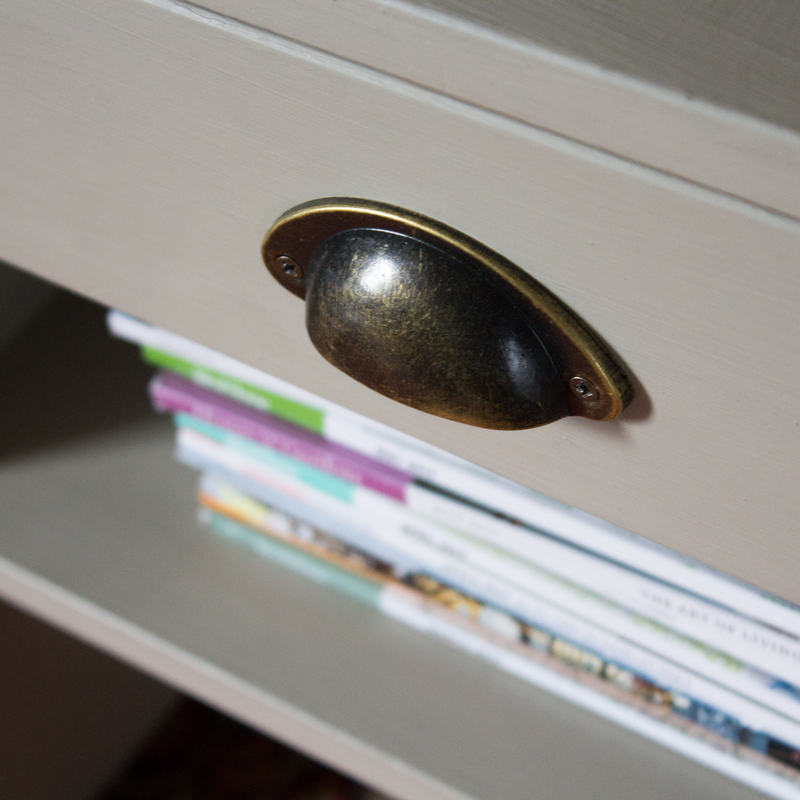 Since then we have been hunting down for bits and pieces to help make the house our home, and one item we have found is these drawers from Calum’s parents. The drawers are Ikea made and are around 25 years old. They came back from Hong Kong with Calum and his family when they moved back in 1997 and been in his parents attic for some time. These were perfect for the spare room and were added to the upcycling project pile. We have upcycled a few bits before and like to think that we know what we are doing to get started, but when we were out exploring the town of Whitchurch, we found the local joinery shop has an attached boutique – JuniperBo, selling some great stuff, and more importantly, offers a short introductory course on furniture painting with chalk paint. Calum was signed up and our friend Lauren joined the course, as Lauren and her husband are also in the throws of their own house renovations. The joinery workshop is in the old Whitchurch cinema that closed in 1959. The space makes for a great workshop, a lovely curved ceiling and lots of bits all across the workshop! Lauren and Calum were making plans for a similar space (somewhere). Nikki is a designer by trade and who escaped the rat race to do something creative for herself. This lead to the setting up of JuniperBo, specialising in upcycling, painted furniture and repainting kitchens. 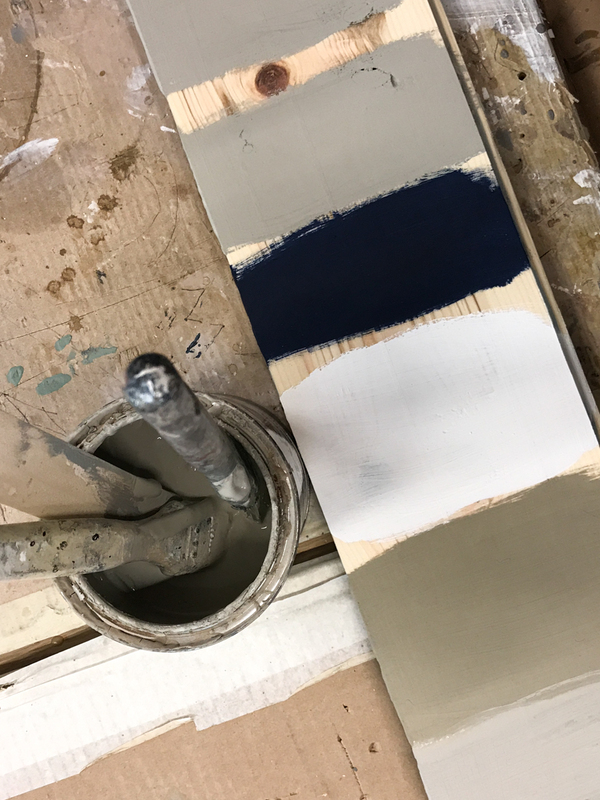 Nikki took us through the ins and outs of chalk paint, how it works with wax, finishing coats, sheens and some pit falls to avoid. 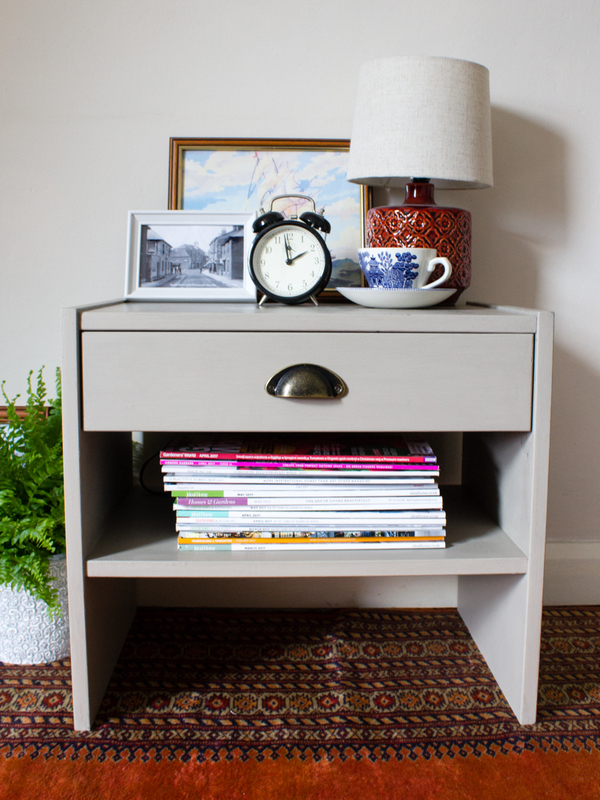 Thankfully with chalk paint, mistakes can easily be covered up! 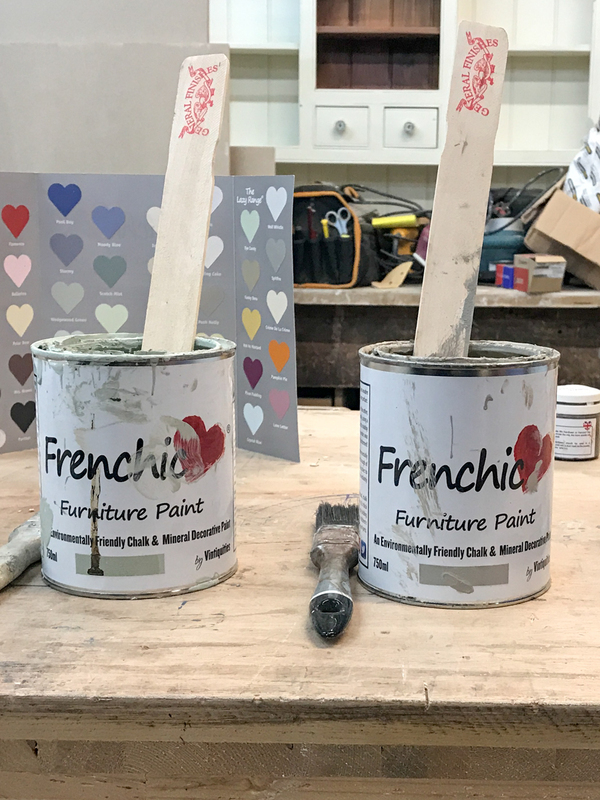 The best thing to do before painting furniture is to use the chalk paint on some scrap wood to get an idea of the paint; colour, finishes and how different paints and waxes work together. 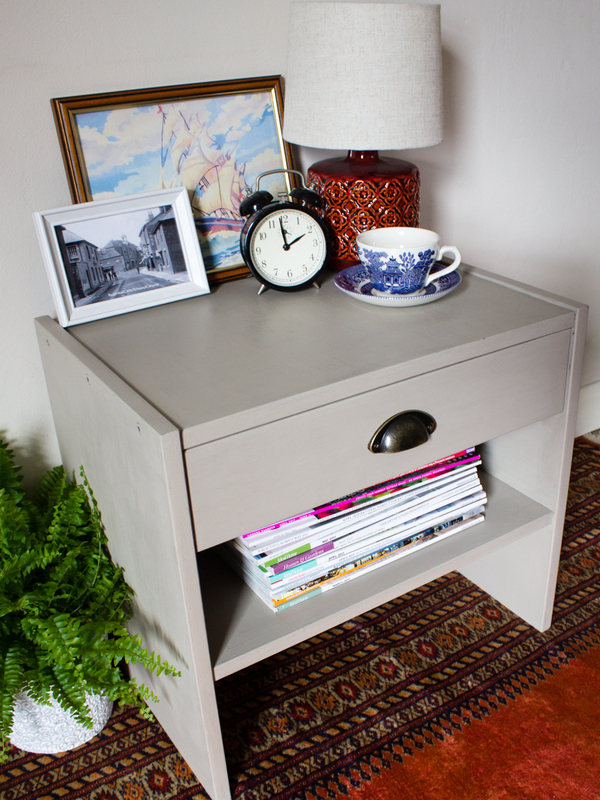 A couple of combinations of paint and wax later, we found ‘the one’ combination that worked for us and we were ready to start the upcycling process and paint the pieces we brought with us. 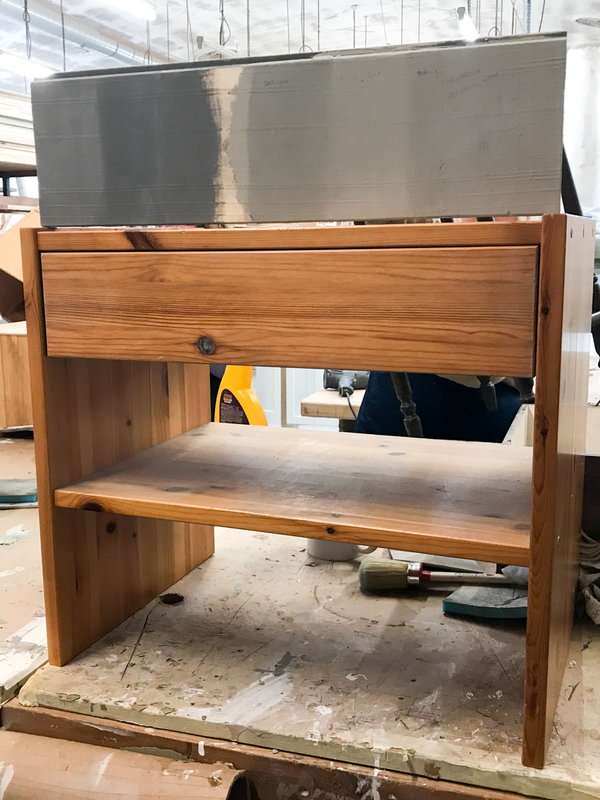 Whilst there is no need to sand the wood with chalk paint, sanding the bedside table did help remove lots of wear, a good clean of the wood with a general purpose cleaner and we’re ready to paint. As usual, painting will require two or three coats to give it a good colour and coating. Finally, when its dry, a good coating of wax protects the paint and prevents staining and loss of colour. A few finishing touches and we have the final piece ready for the spare room. 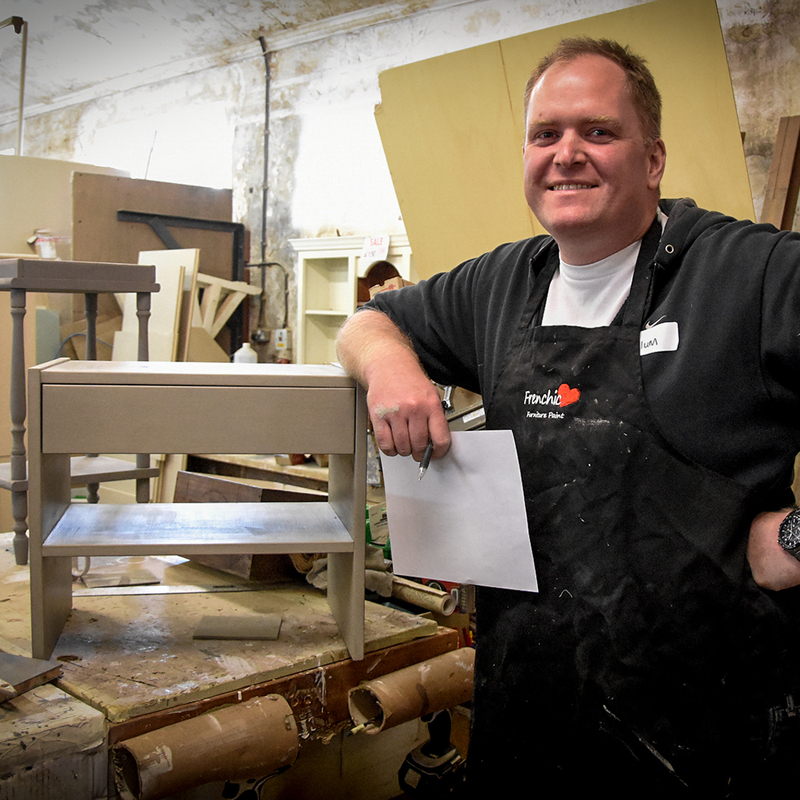 It was great to know that we had being doing things correctly and still learnt a few things on painting furniture. Well worth going on if you are interested in upcycling. We have rehomed a cat from the nice people at Cats Protection. 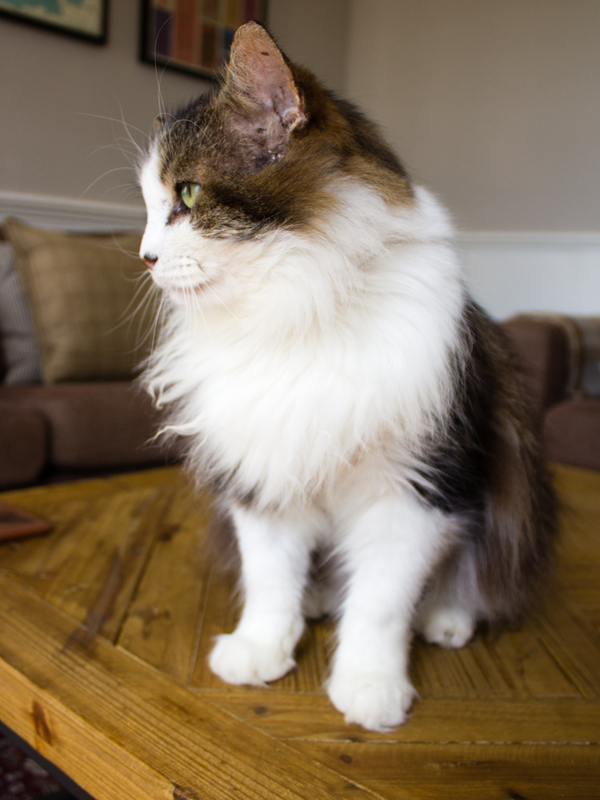 Meet Gustav, out 11 year old domestic long hair cat! We might be a bit bias but we have decided he is, in fact, the best cat ever! Getting pets has been high on our agenda since we moved, we both feel a house isn’t just not a home without some furry critters wandering about. We had been in contact a couple of branches of Cats Protection, having a house visit to make sure we were suitable. As we are quite close to a road so we decided that it would be best to rehome an older cat that is less likely to go wandering. Gustav was in the Newbury rehoming centre, he was looking in a bit of a sorry state. He had come into the centre with serious teeth issues which has resulted in a lot being removed. He had matted hair on his tummy that had had to be shaved off and and had a bad case of fleas that they need to treated. 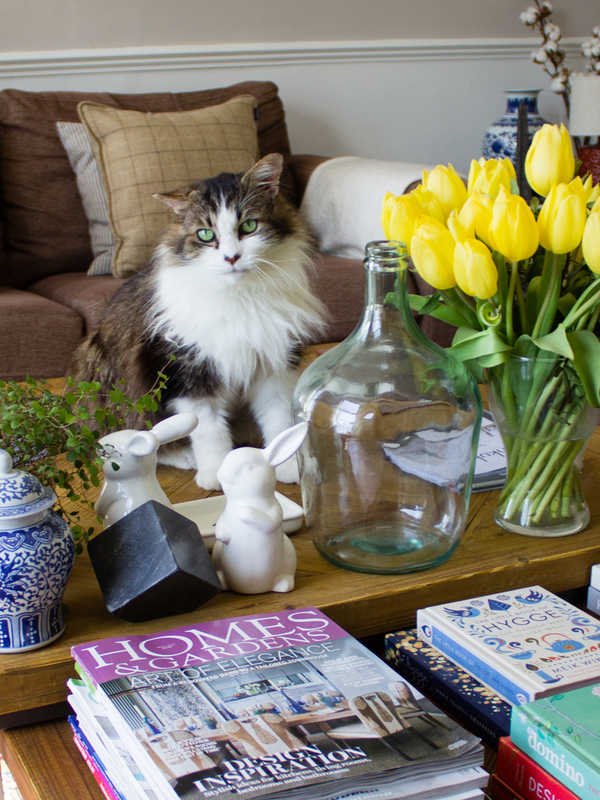 Despite all of this on meeting Gustav we almost instantly knew he was the cat for us. He was friendly and confident which endeared him to us. 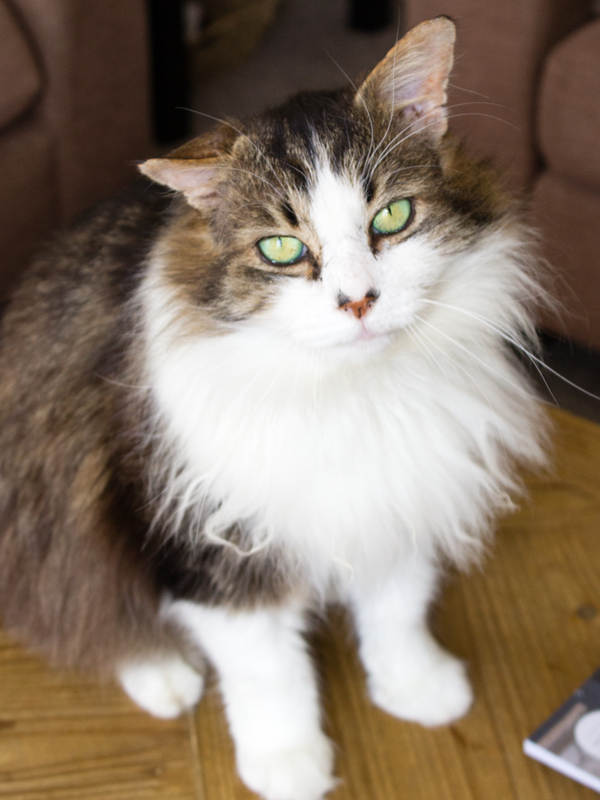 Despite his straggly appearance, and wonky ears we could see he was a majestic cat. So the deed was done, we signed on the dotted line and the very next day Gustav came home with us. He was a bit on the nervous side to start with, but soon came out of himself. Gustav loves his food which is helping with training him. He is very playful so we have stocked up on all sorts of cat toys. He loves chasing these about the place and when he tires he spends the evenings curled up on one of our laps. We have introduced Gustav to Rich’s folks dogs and he took that all in his stride so we are confident when we finally get round to getting our puppy he will not be put out. Gustav wasn’t his original name, but we decided with his regal looks he needed a regal name. 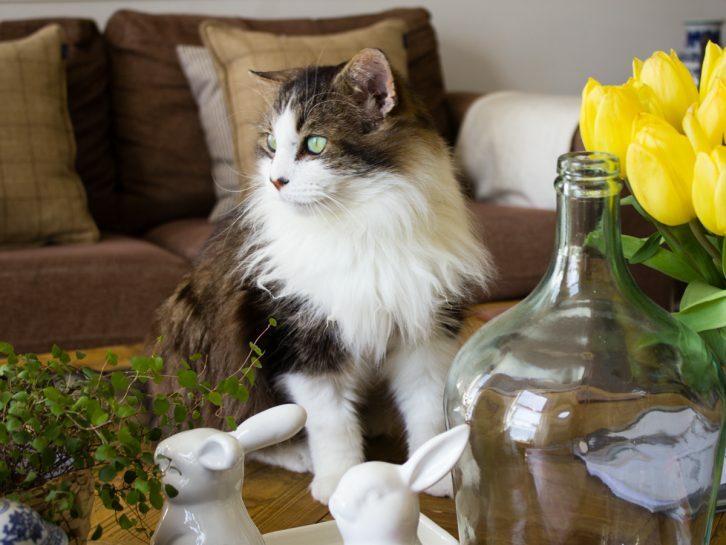 He is therefore named after King Gustav III of Sweden, we think it suits him very well! We can’t thank the people at Cats Protection enough, especially the staff at the Newbury Rehoming Centre. 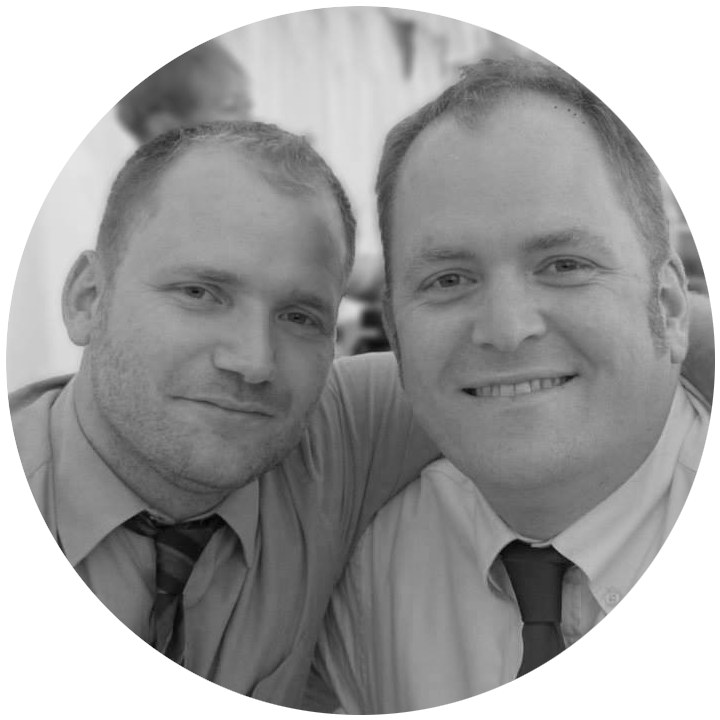 They were helpful, informative and very supportive. 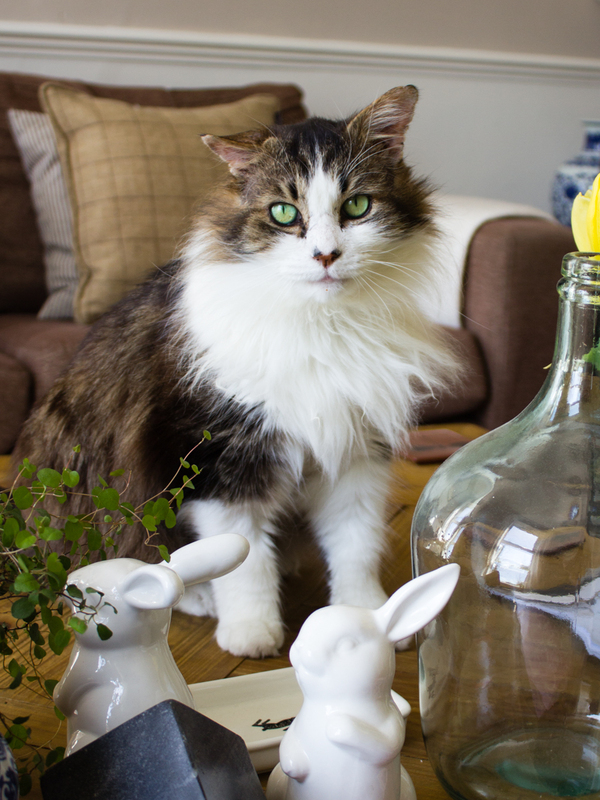 If you are looking to rehome a cat, we cannot recommend them enough. One of the reasons we decided to move out into the country was we could afford to buy a house with more space. We loved living in Hampton Wick, but if we were to buy there we’d be lucky to afford a one bedroom flat. Having made the move to Whitchurch we had gained space but one downside of this is our furniture was purchased for a small flat and doesn’t fit. 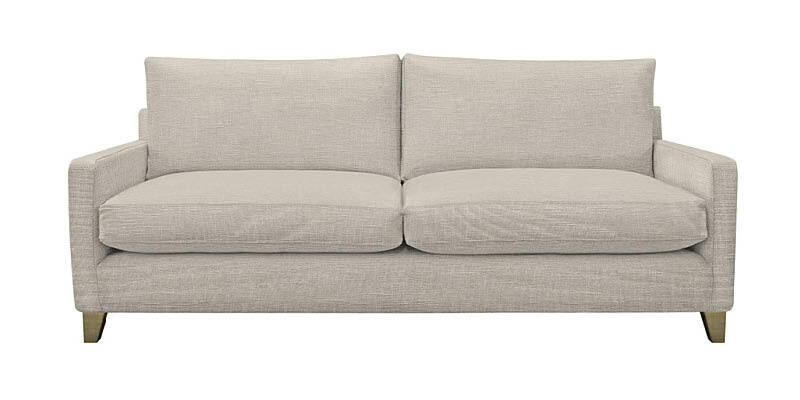 We have therefore decided that it is time to buy a new sofa, well actually a pair of sofas. We are looking to buy a two seater and a three-seater sofa for the living room, we will compliment these with a couple of accent chairs so we should be able to seat six comfortably. Having gone around several show rooms we managed to decide on style we like – a classic and mid-century inspired. Other considerations were the fabric choices, sizes and availability. Sofa.com offer a great selection with loads of fabric options. 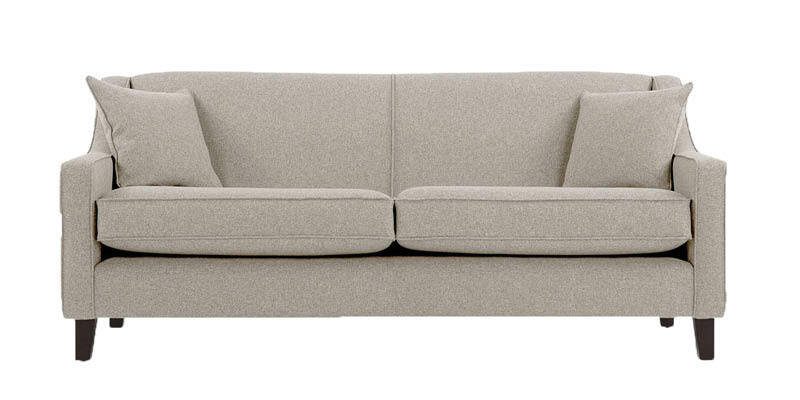 This Iggy sofa met many of our requirements but was probably a bit over our budget. 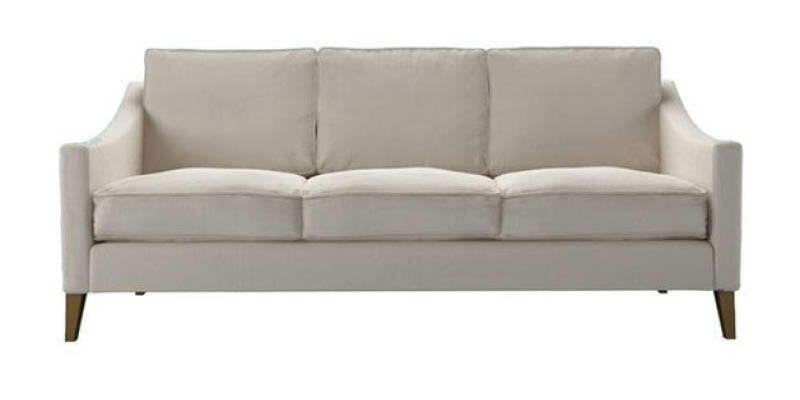 From Sofa & Stuffs pronto range, this Paddington sofa is the right style and size. The pronto range has less fabrics to choose from, but we are after a neutral finish so we managed to find something that would work. 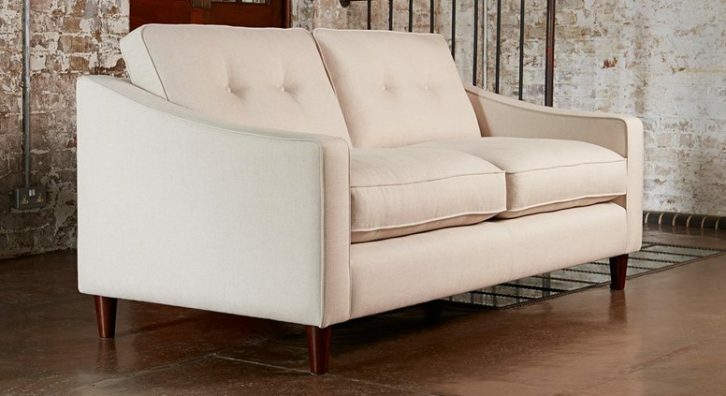 We love the style of this sofa, especially the button sofa backs. 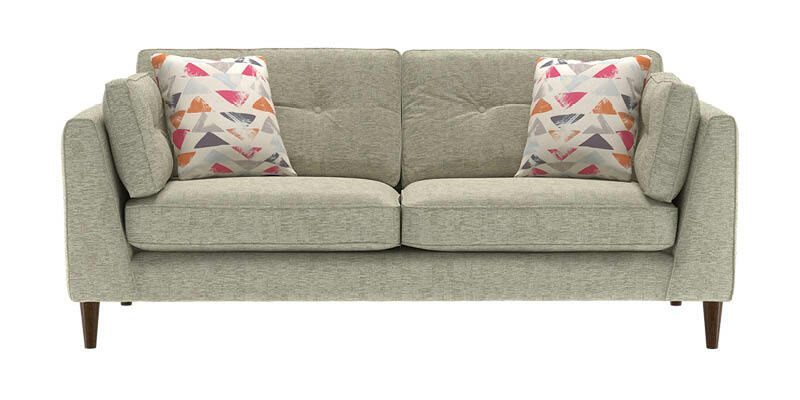 The Bond St Sofa fitted the bill in terms of size and budget, we also loved the Denbirgh Fabric option. A classic and elegant style but missing the mid-century vibe we like. Sofology was a revelation to us, they had a great range at a reasonable price. The Cricket caught our eye with its mid-century styling. 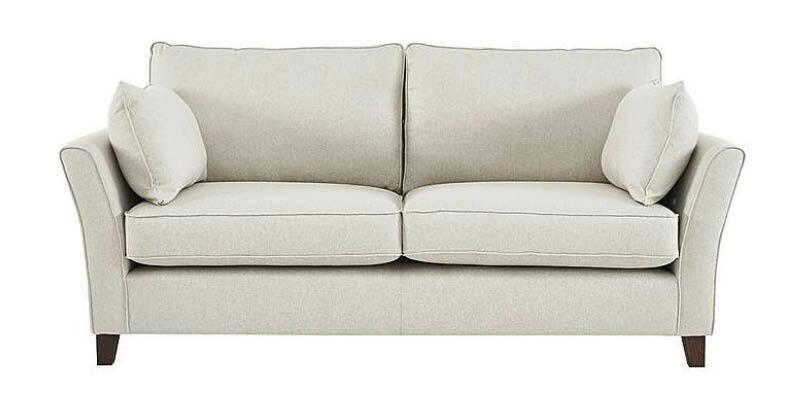 Size wise was a touch too large for us and we weren’t massively keen on the fabric options but overall a great sofa. We are probably a bit bias as our godson is called Dexter! We like the simplicity of this style, but not as strongly mid-century as other options, and a bit over budget. The Budget option from Made.com. In many ways, this could be a good option, but is only available in limited sizes and fabric options so not quite right. 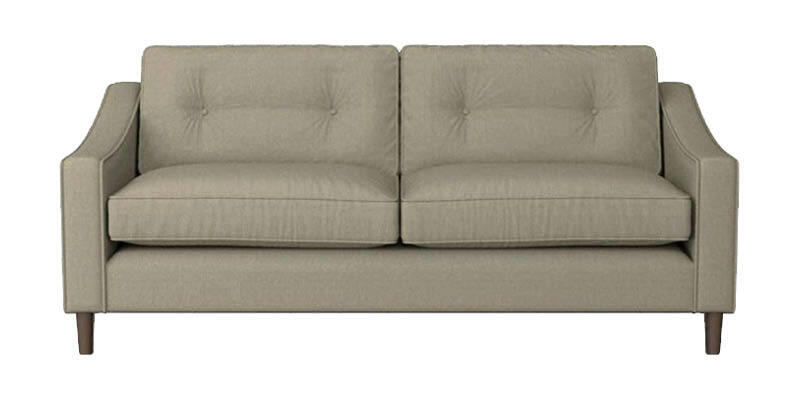 After looking at lots of options we think we are going to go with the Paddington from Sofa & Stuff. It is the right combination of Price, Size, Style and fabric choices. We will probably buy the sofa soon, although having said that our dishwasher has just given up the ghost that is a priority first! What do you think, what is your favourite sofa?